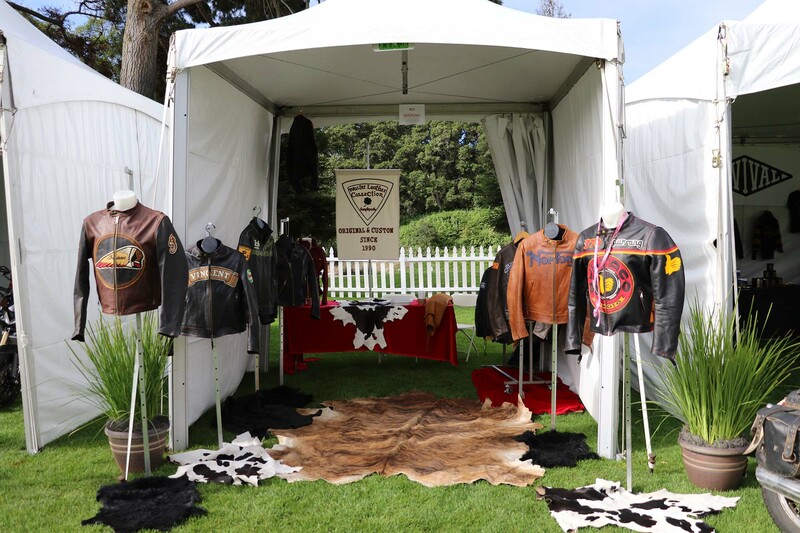 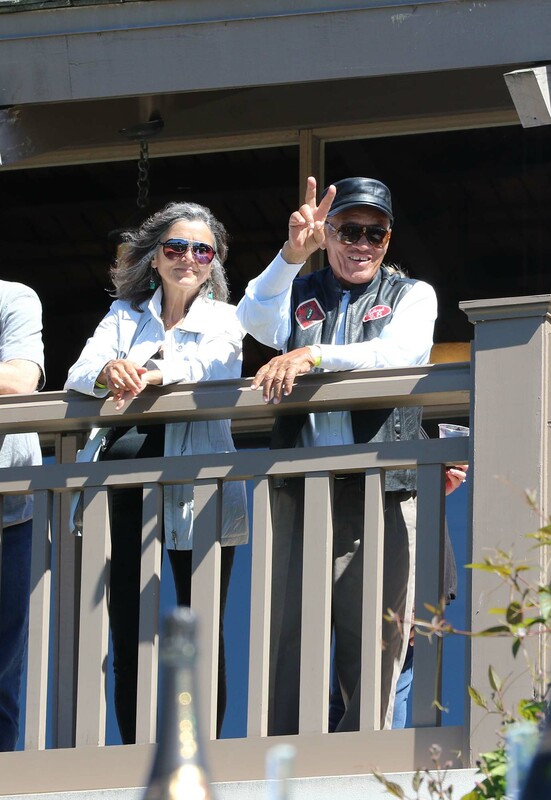 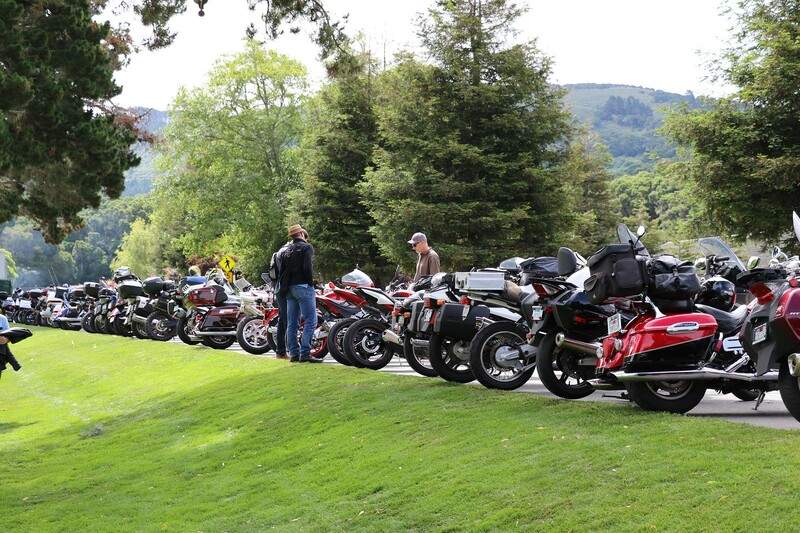 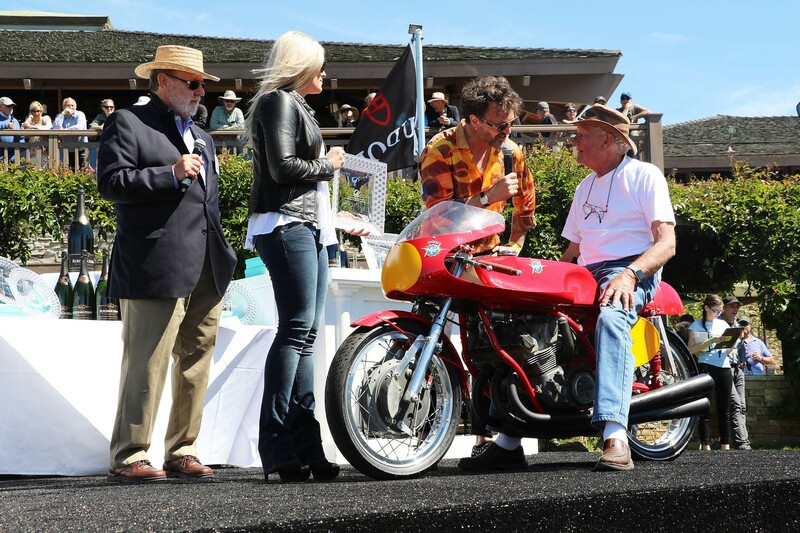 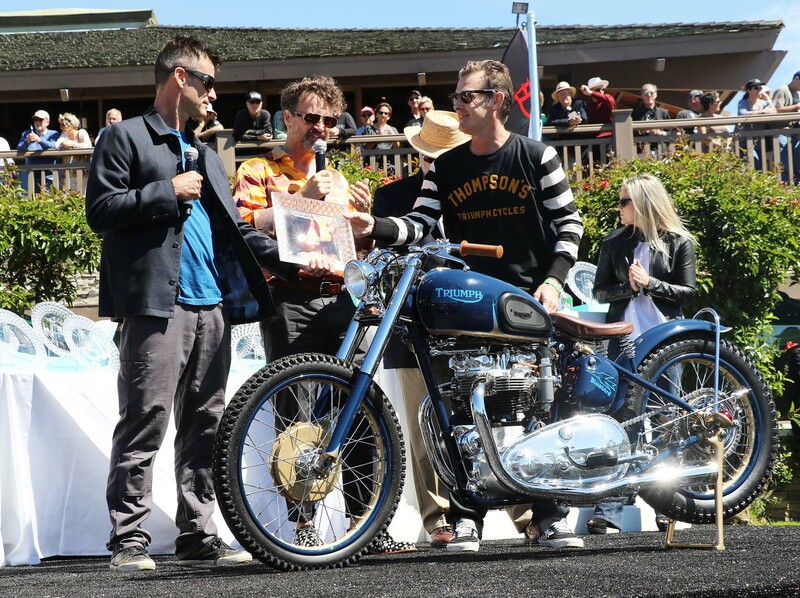 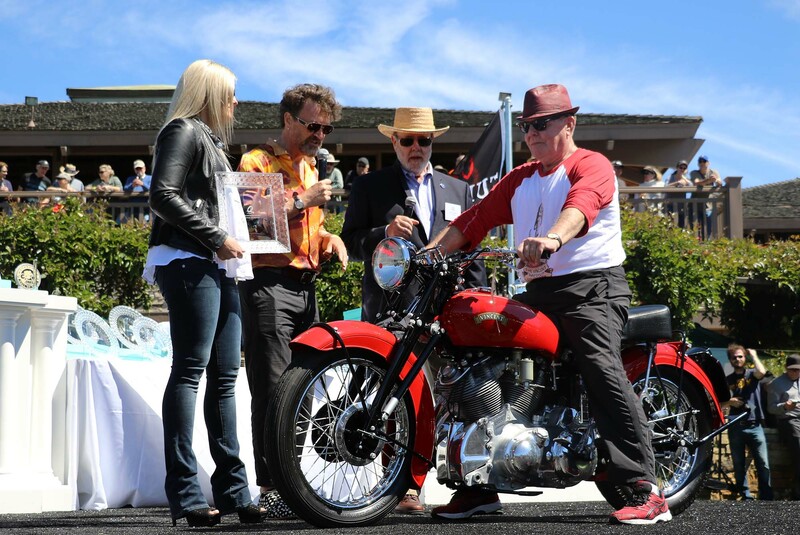 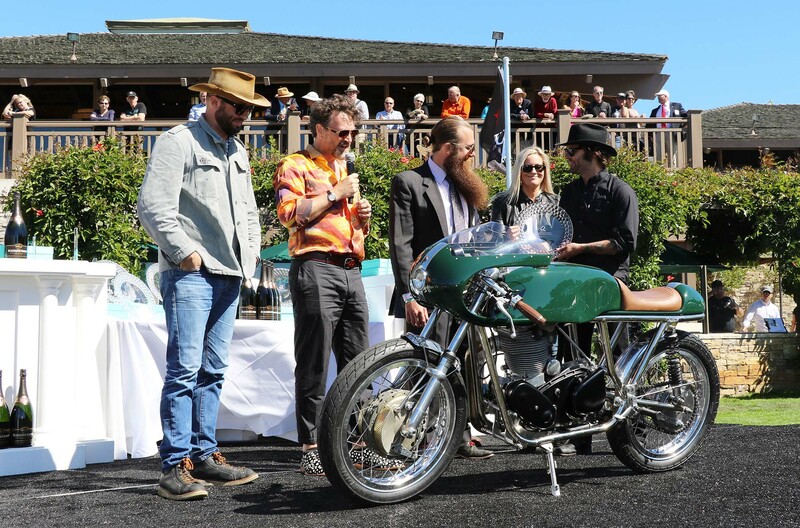 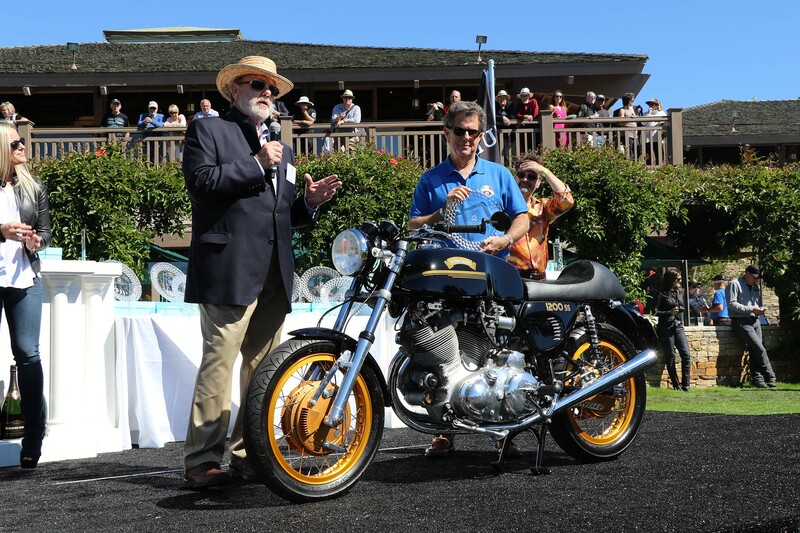 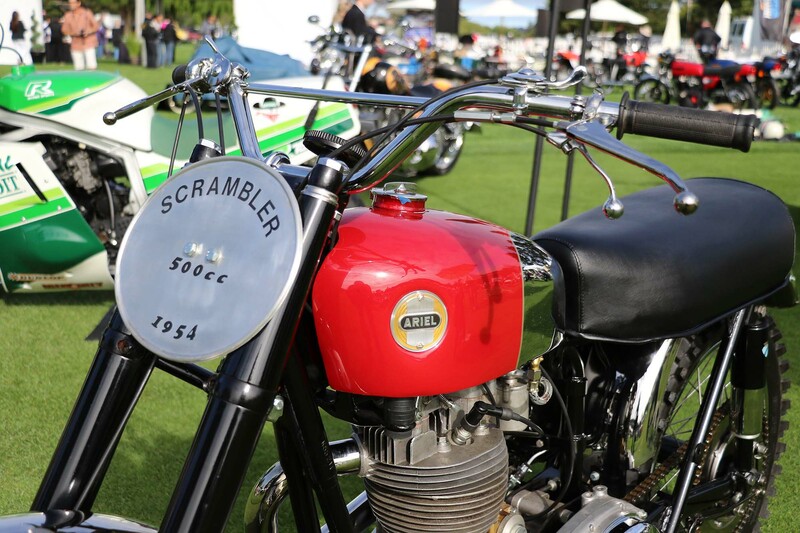 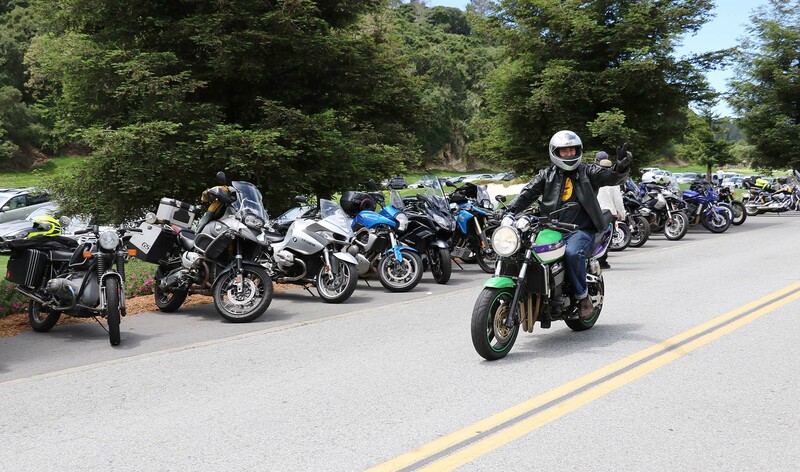 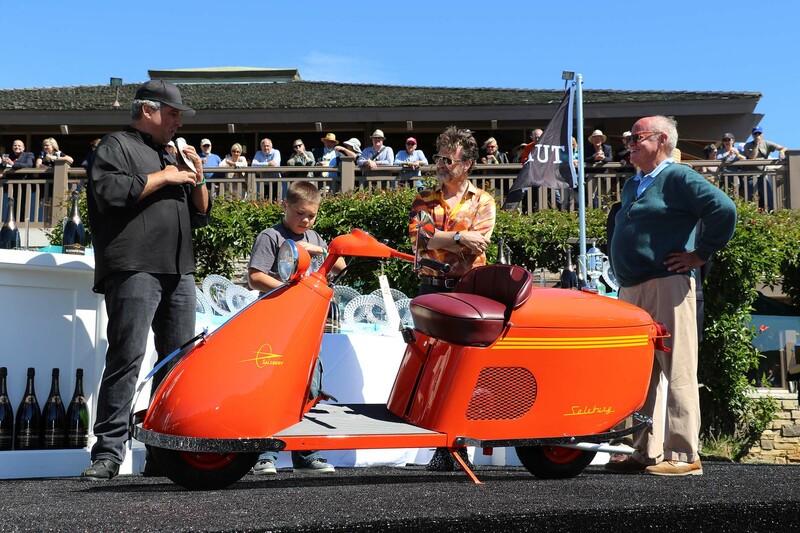 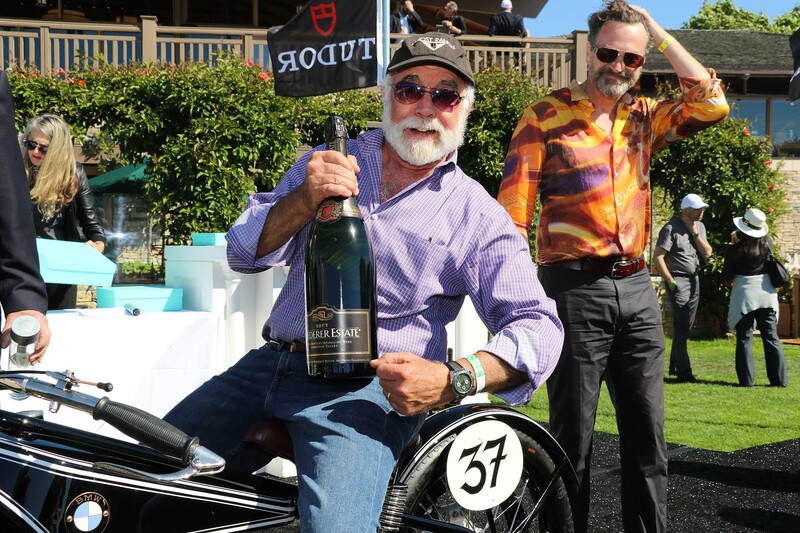 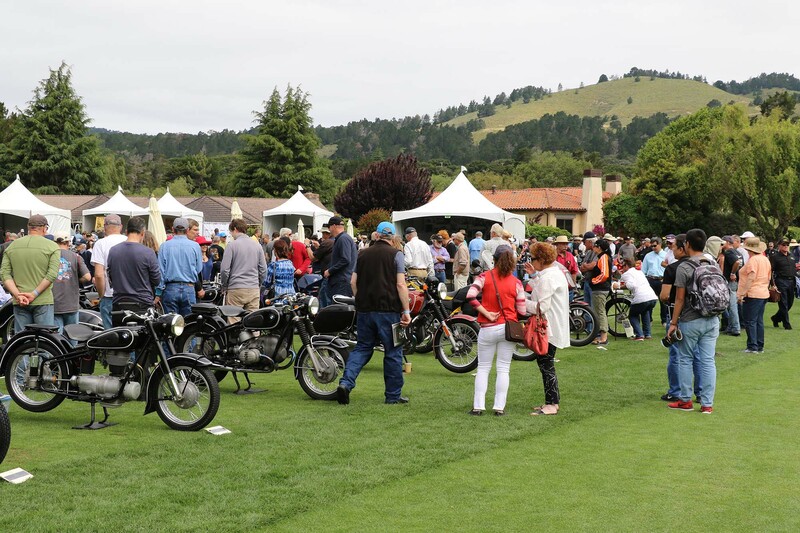 This past weekend, nearly 3,000 motorcyclists descended on the Quail Lodge and Golf Club in Carmel, California. 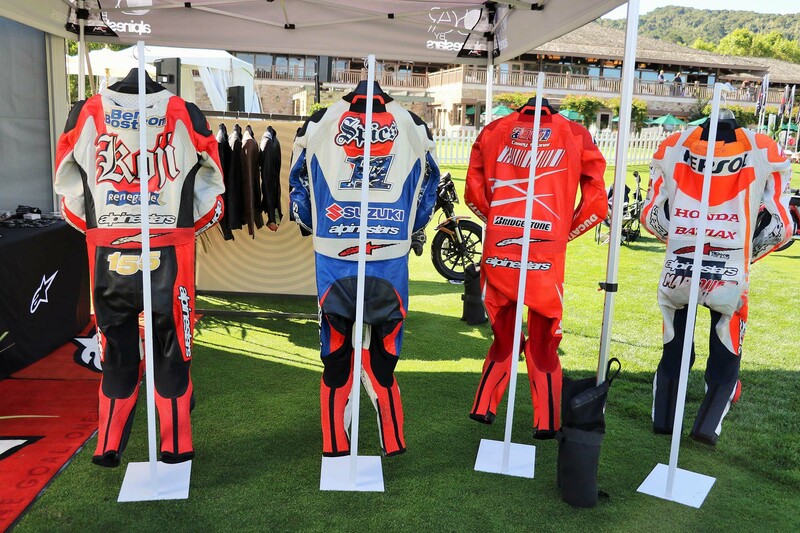 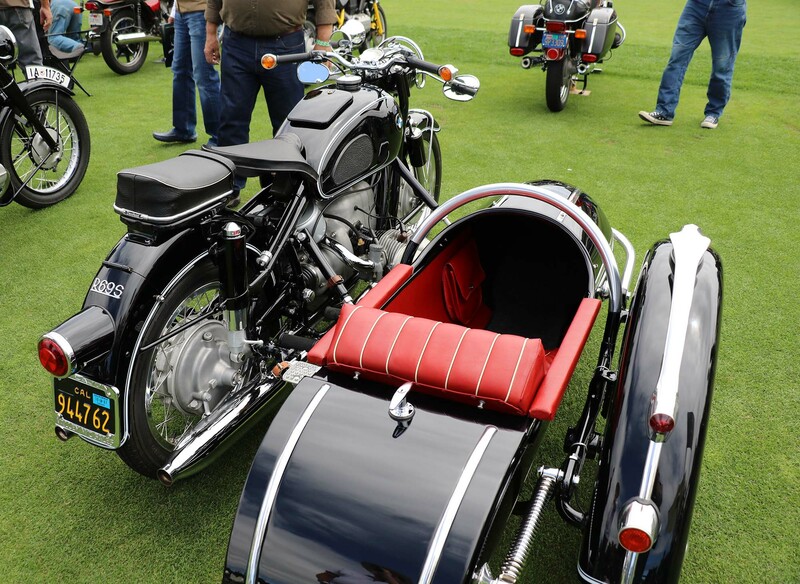 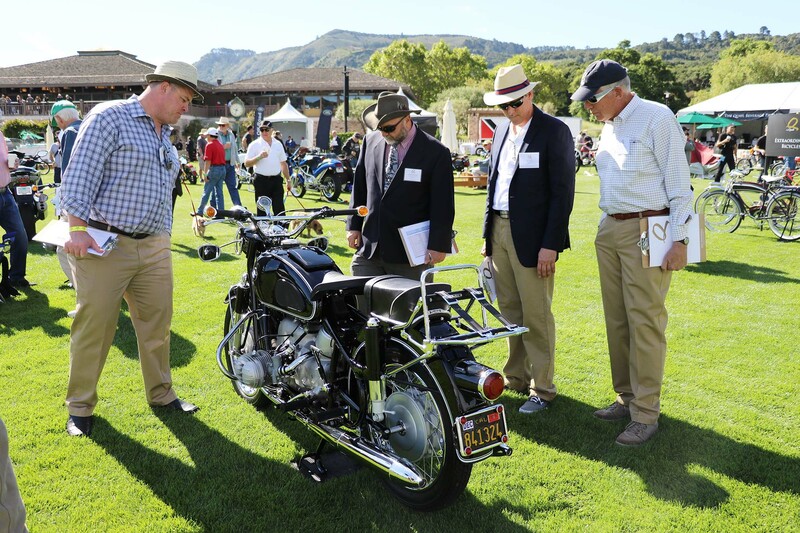 They didn’t go to the Quail to golf; rather, they went to see the 8th annual Quail Motorcycle Gathering. 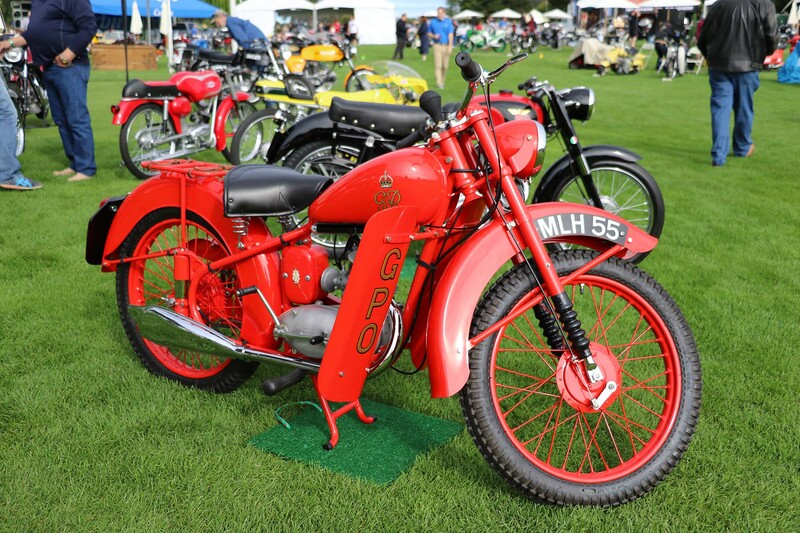 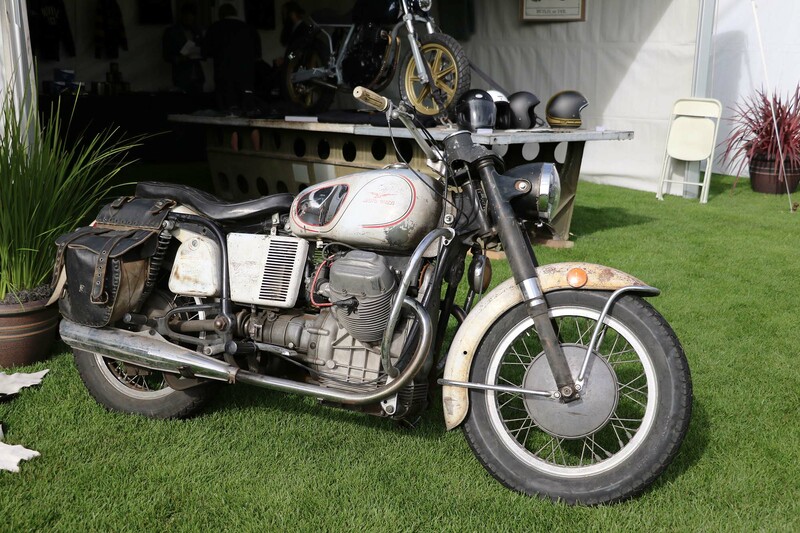 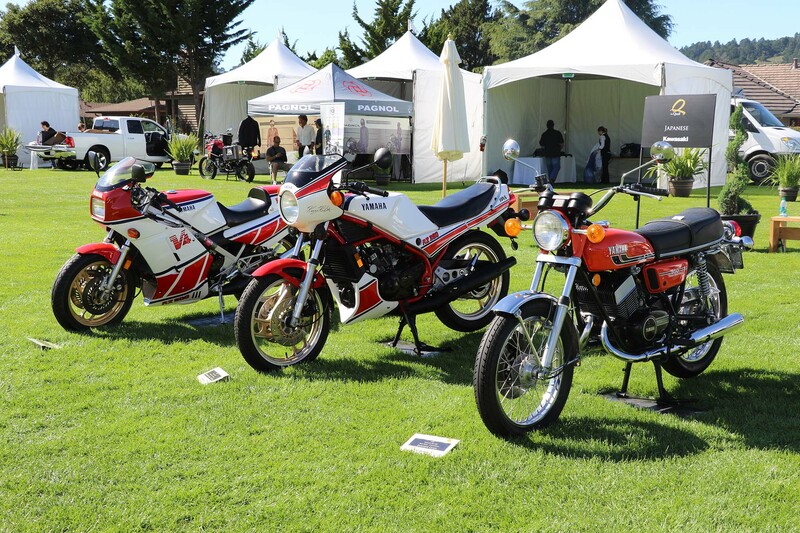 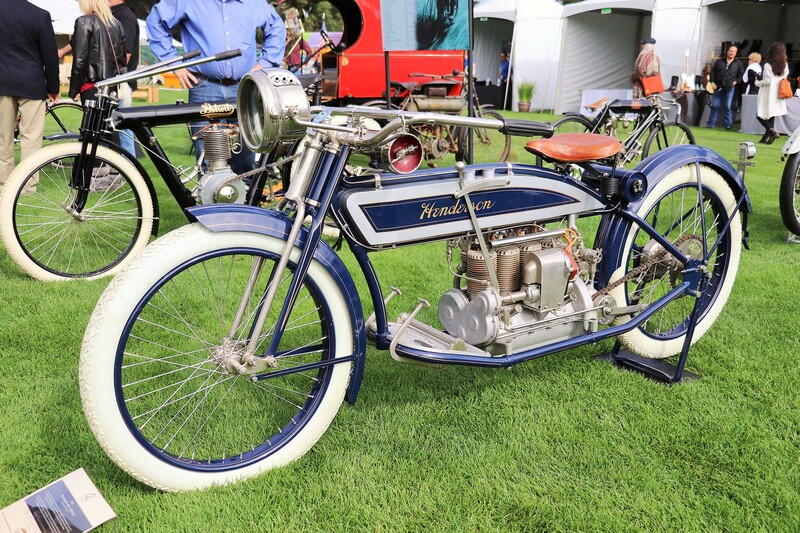 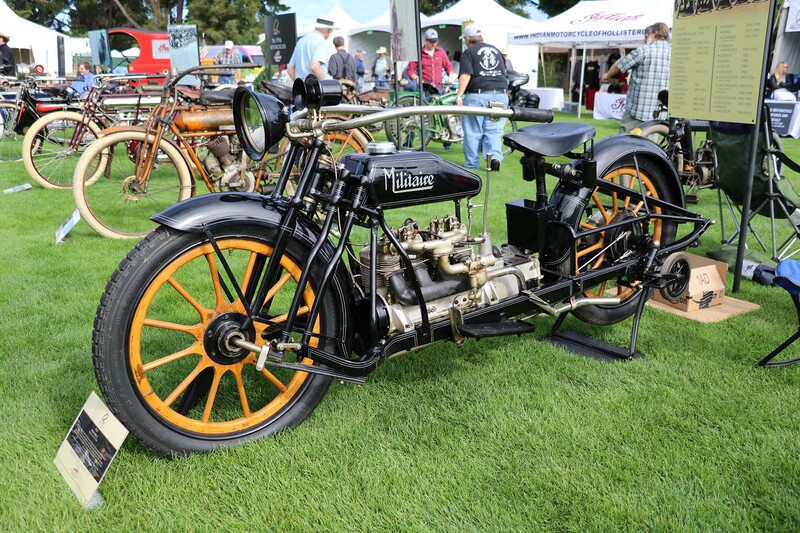 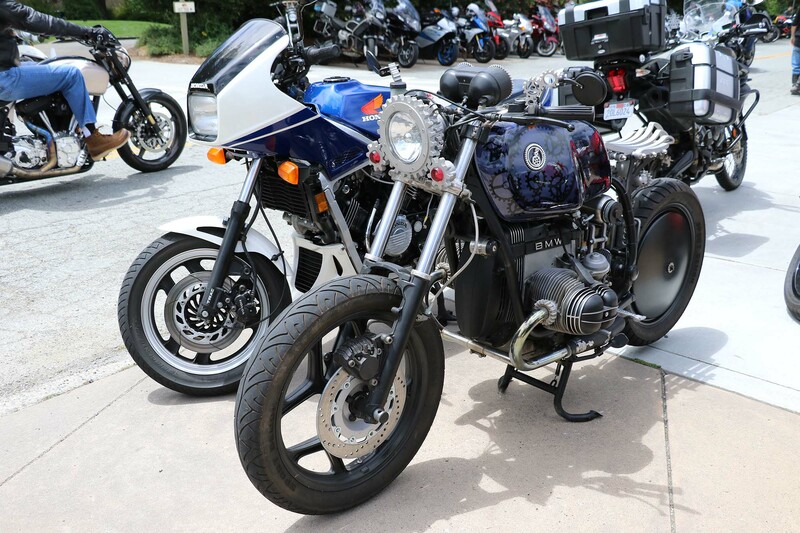 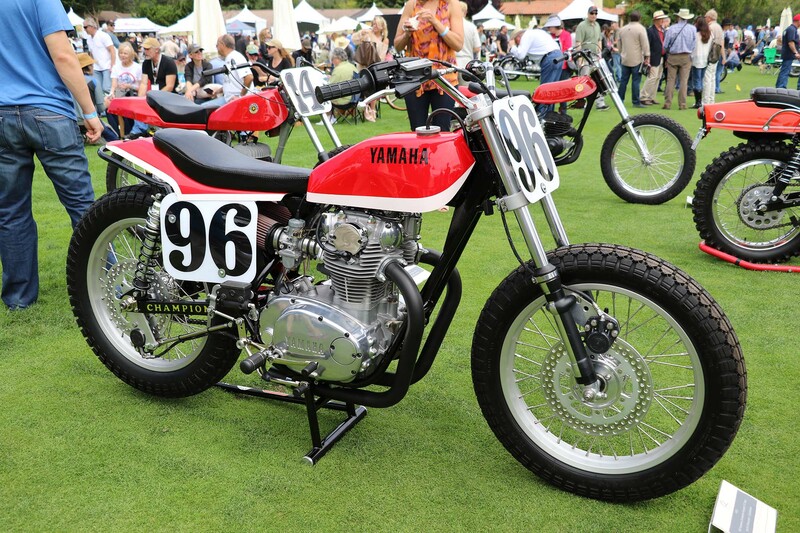 With roughly 400 motorcycles of all genres and years on display, the Quail offered something for everyone. 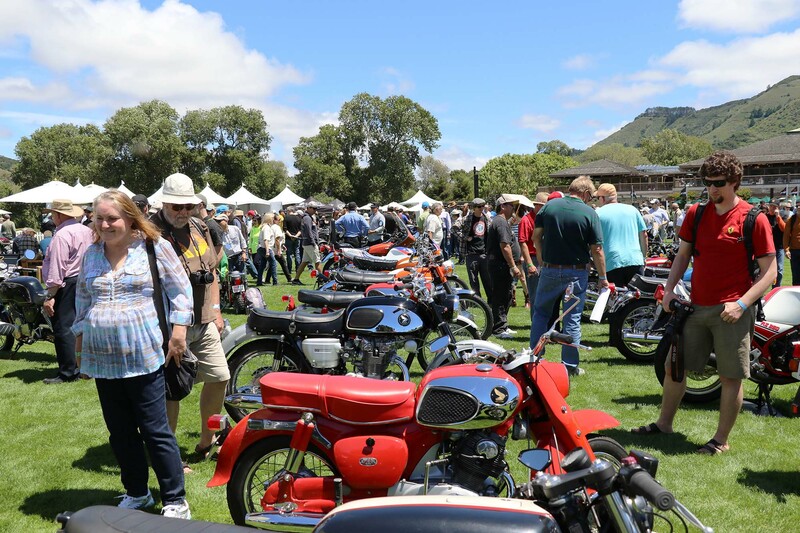 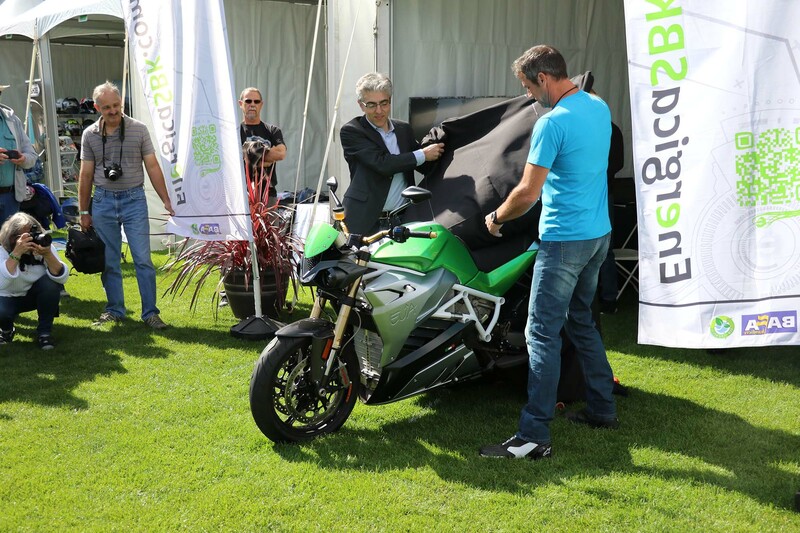 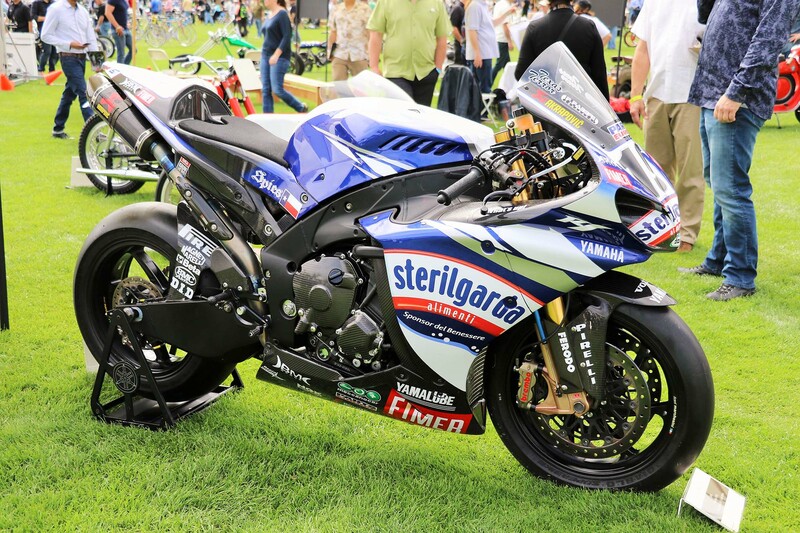 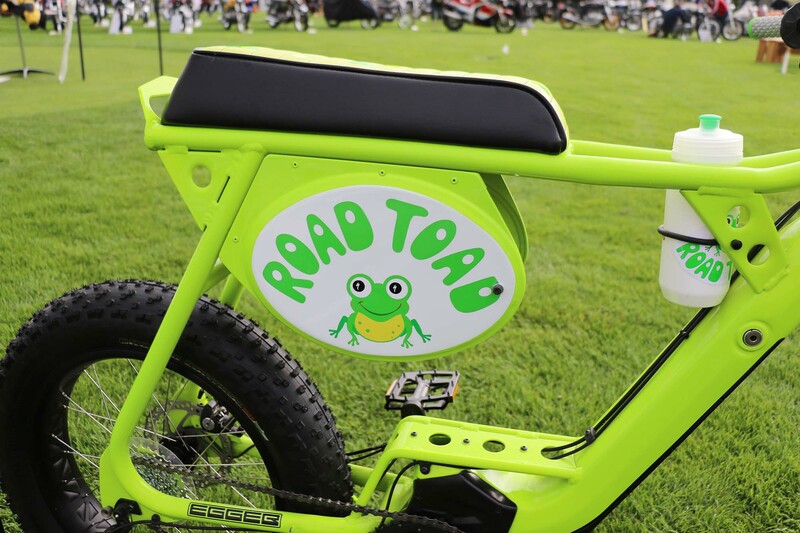 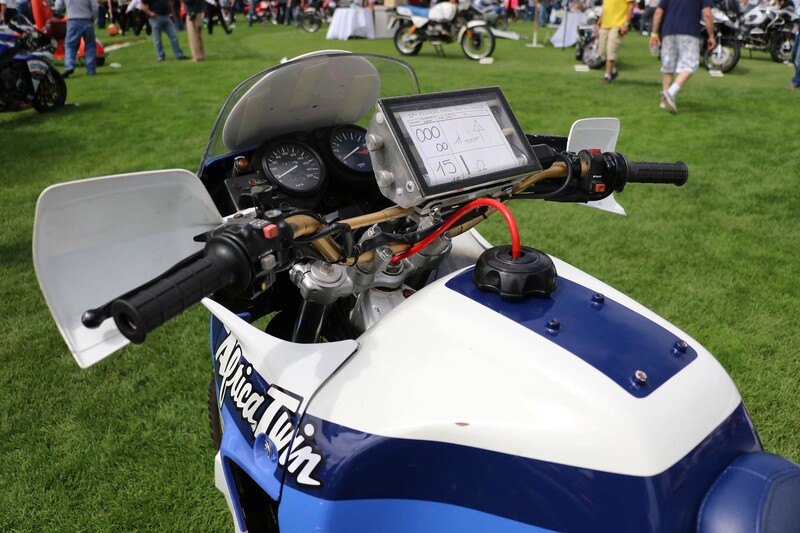 Unlike last year, this year’s event offered a lot more sunshine and warmer temperatures, and featured the 40th Anniversary of the superbike and a tribute to pre-1916 motorcycles. 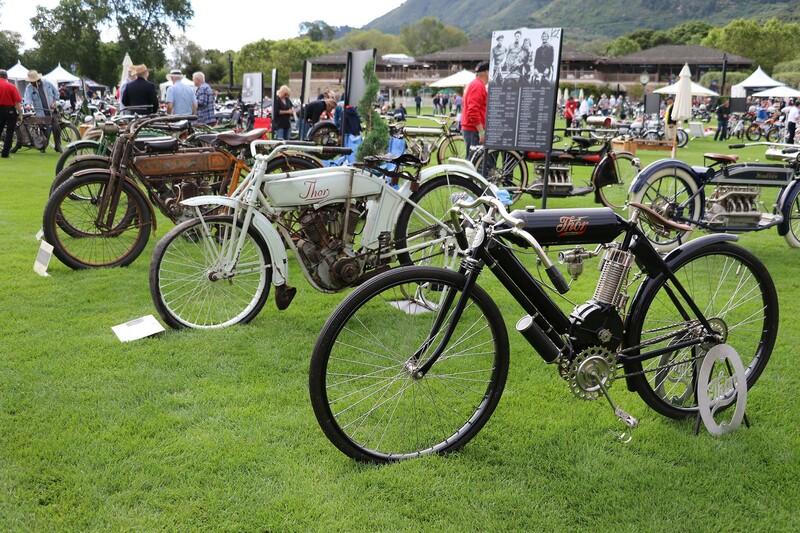 Additionally, there were display categories for motorcycles from all parts of the globe. 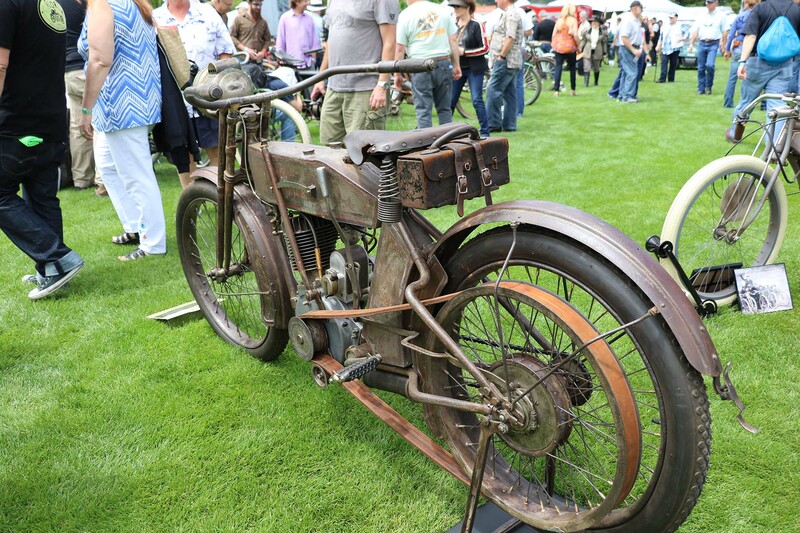 The quantity and quality of the machines on display was impressive. 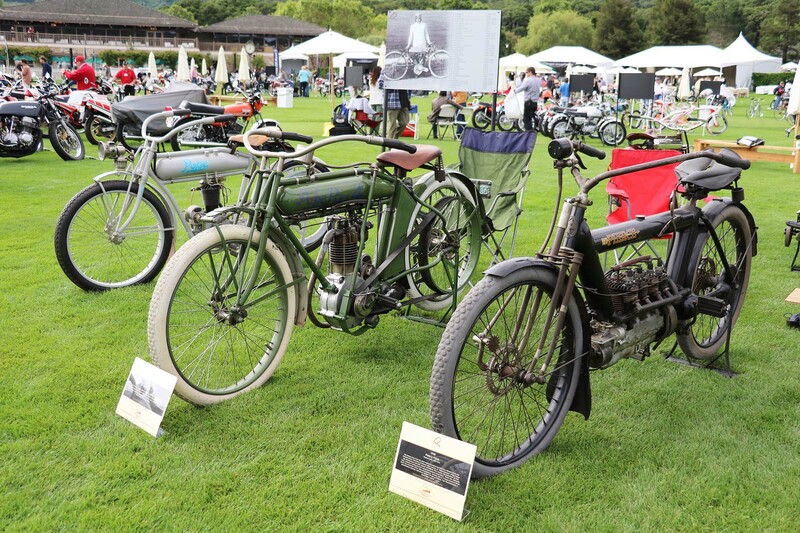 The display of pre-1916 machines showed how far our sport has come in the last 100+ years. 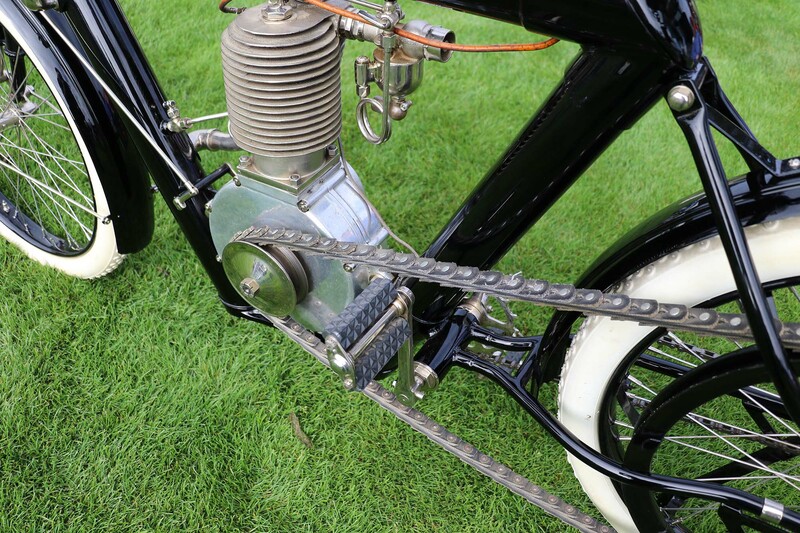 There were bikes with wooden wheels, open valve trains, and outlandish suspension designs. 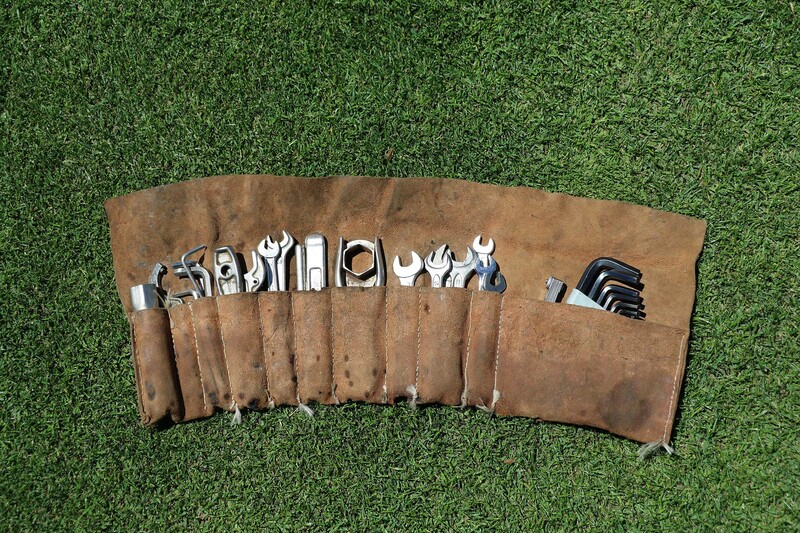 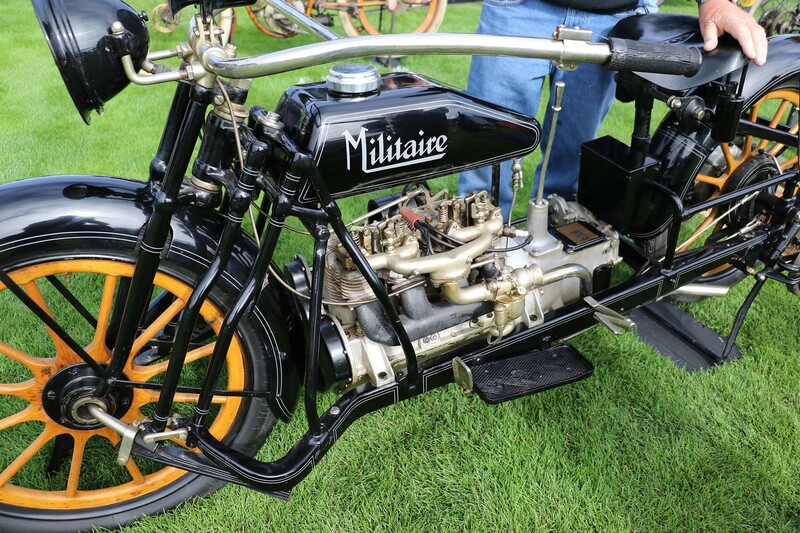 Motorcycle technology was still maturing in the early 1900s and some of the technological innovations were pretty outlandish. 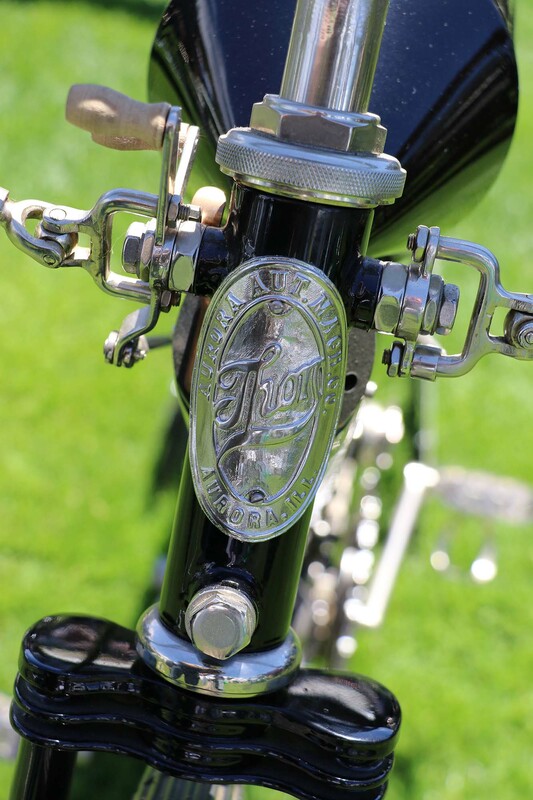 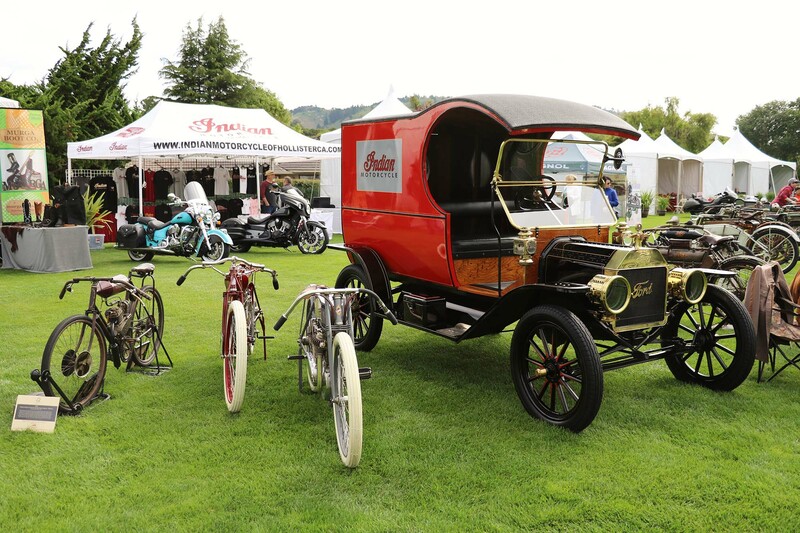 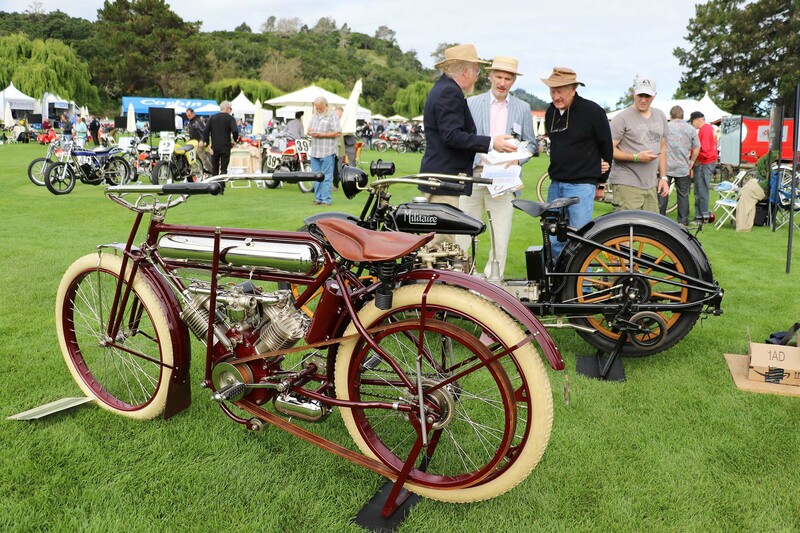 Some of the bikes on display were lovingly restored, such as the 1915 Militaire and the 1910 Detroit Single, while others were displayed unrestored. 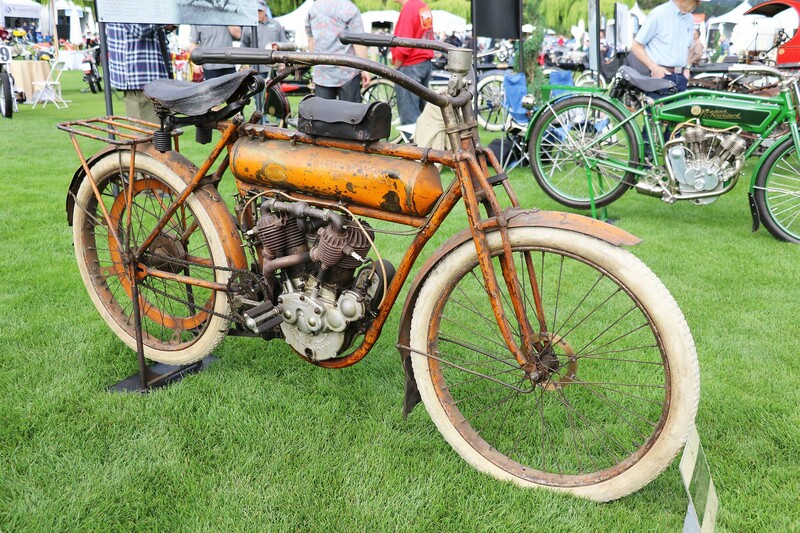 The 1911 Flying Merkel showed the patina of 105 years, but at the same time, was a testament to the durability of its original design. 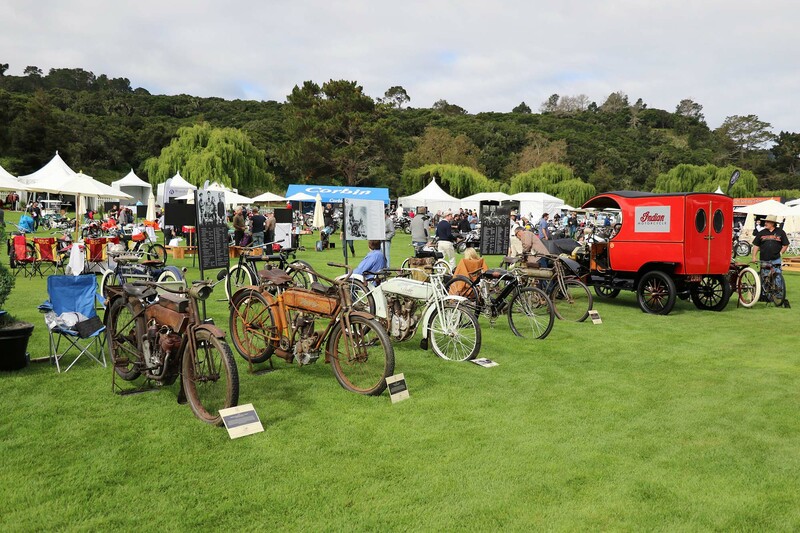 It was really great to see so many bikes from the early history of motorcycling in one place. 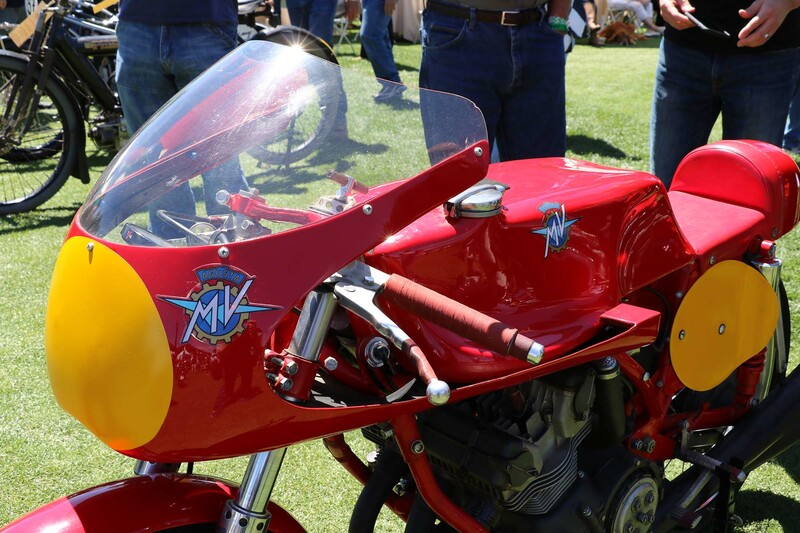 This year also marked the 40th Anniversary of the Superbike. 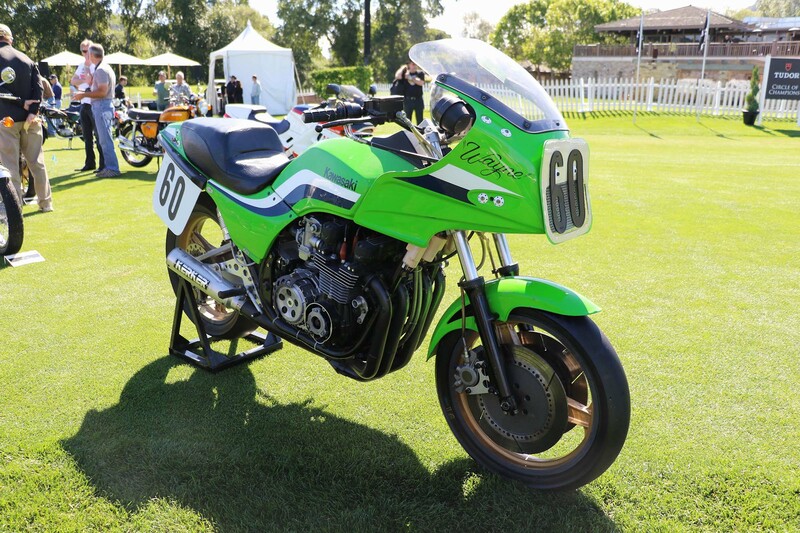 The first bike to catch my eye as I entered the superbike display was the bright green number 60 of 1983 AMA Superbike champion, Wayne Rainey. 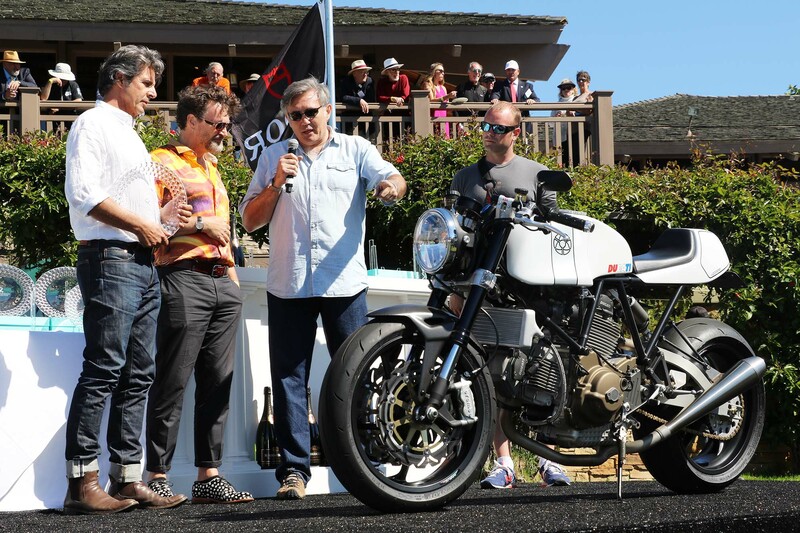 The bike brought back great memories of Rainey and his mustachioed mechanic Rob Muzzy. 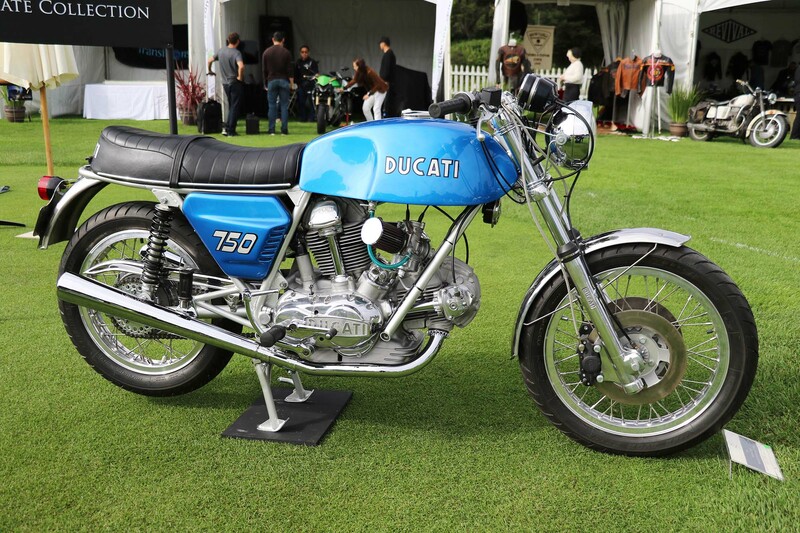 Besides the big green Kawi, there were also great examples of superbikes from Honda, Ducati, BMW, and Laverda. 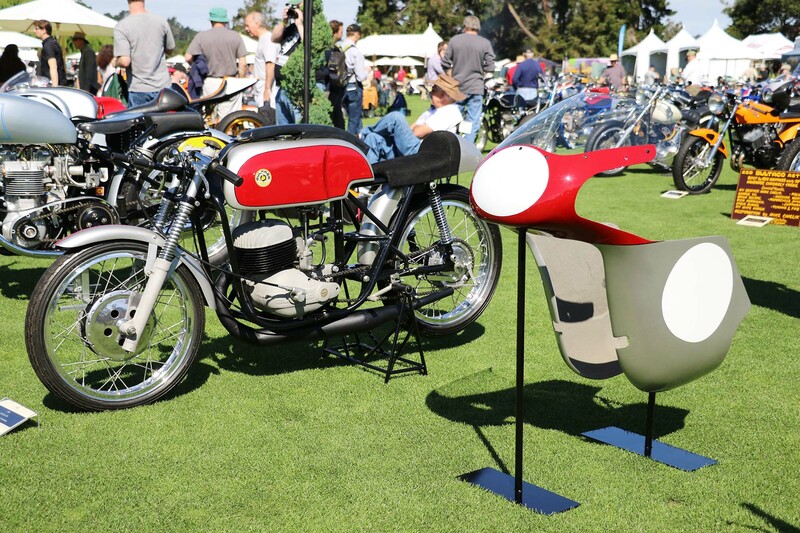 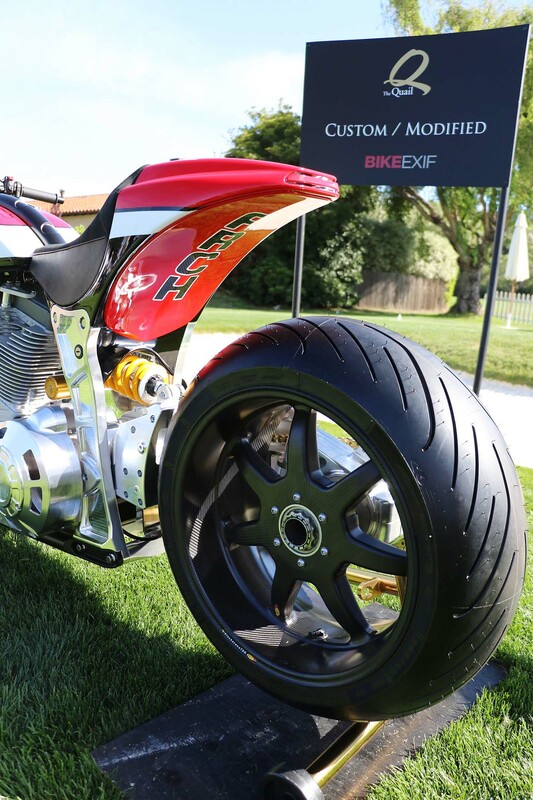 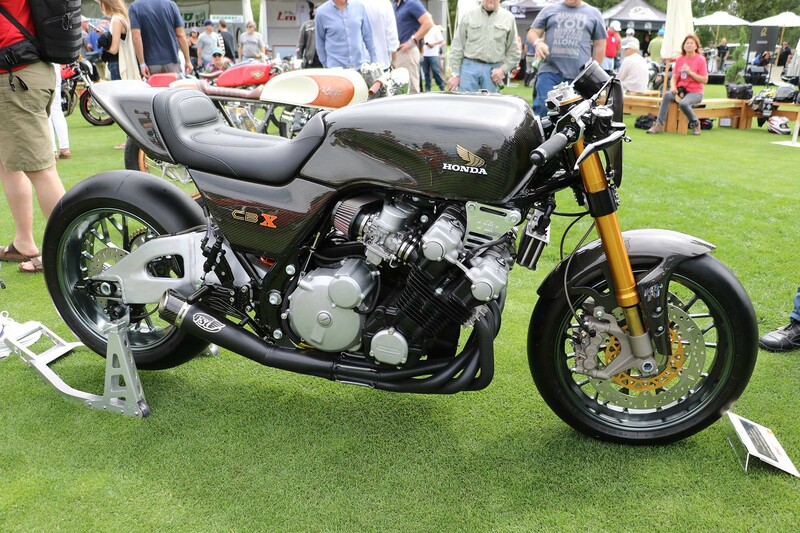 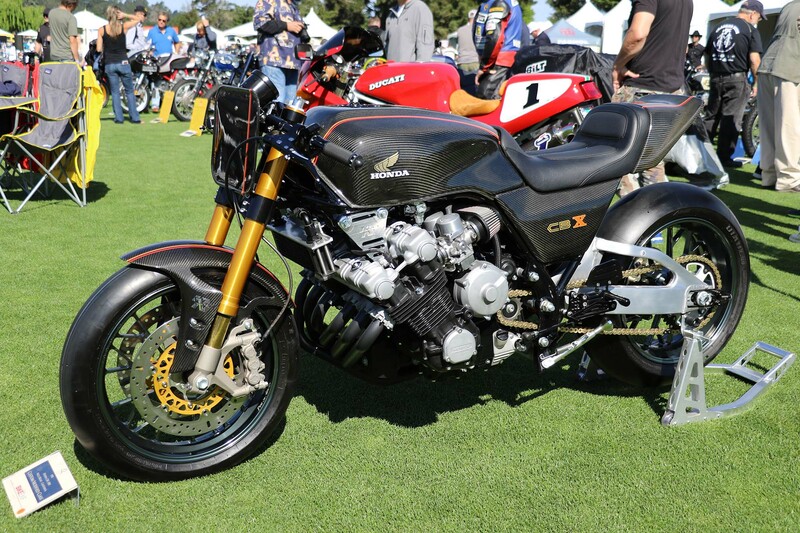 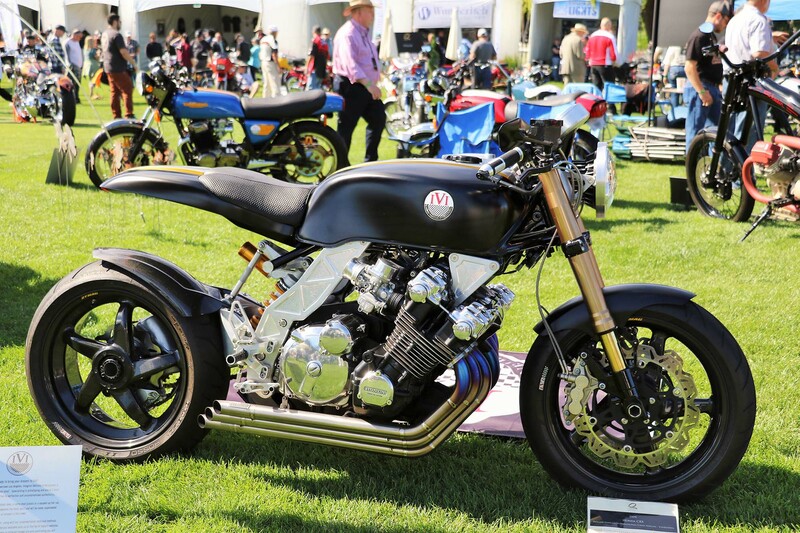 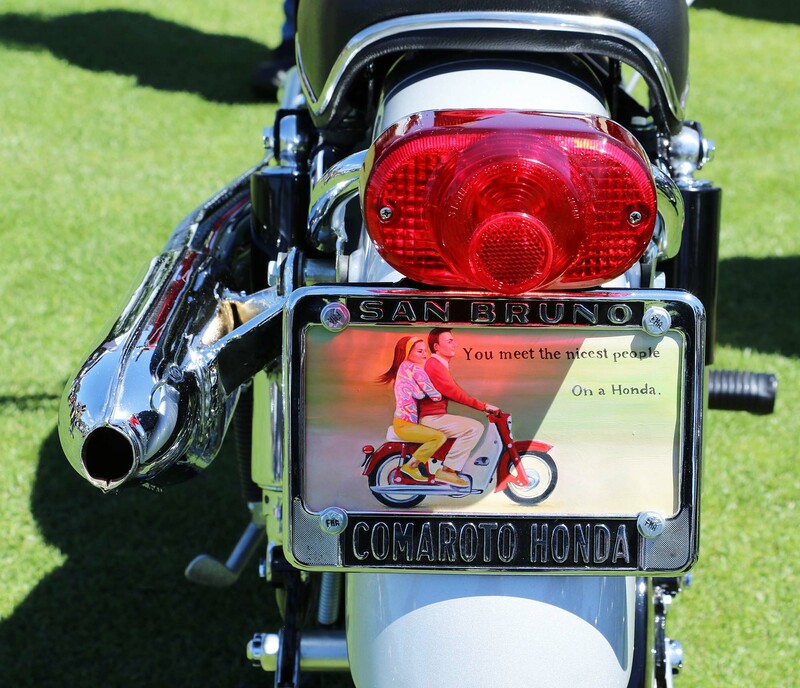 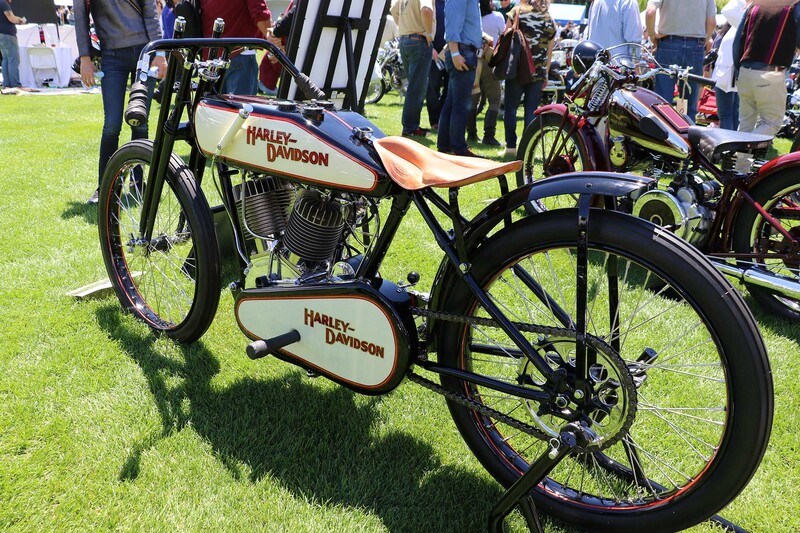 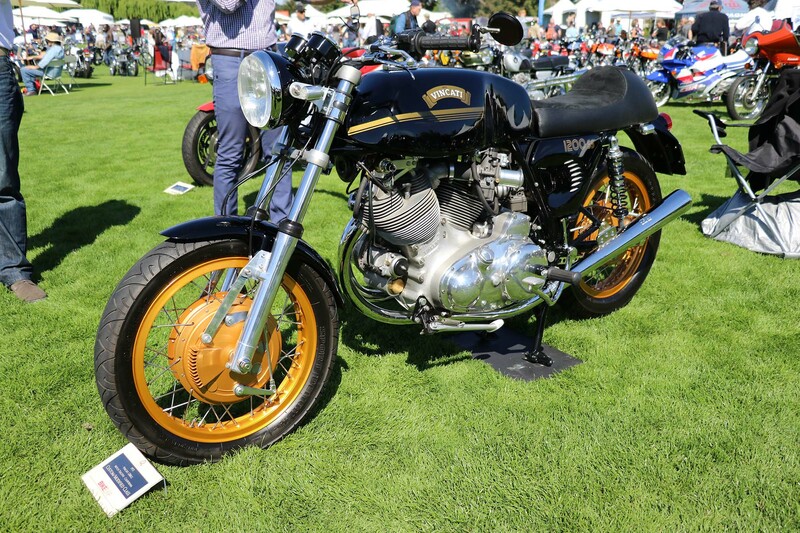 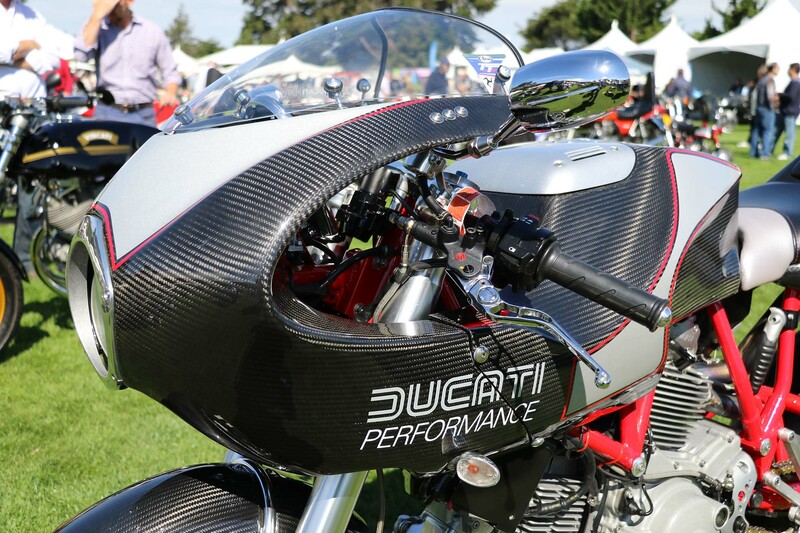 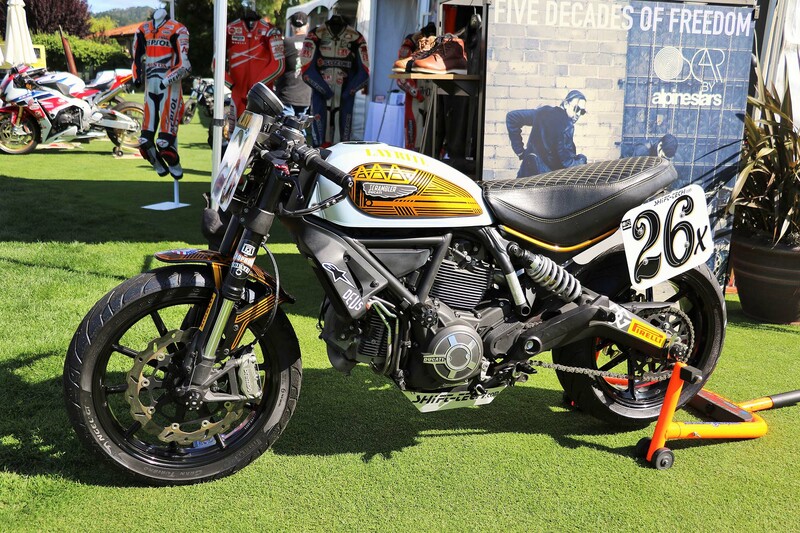 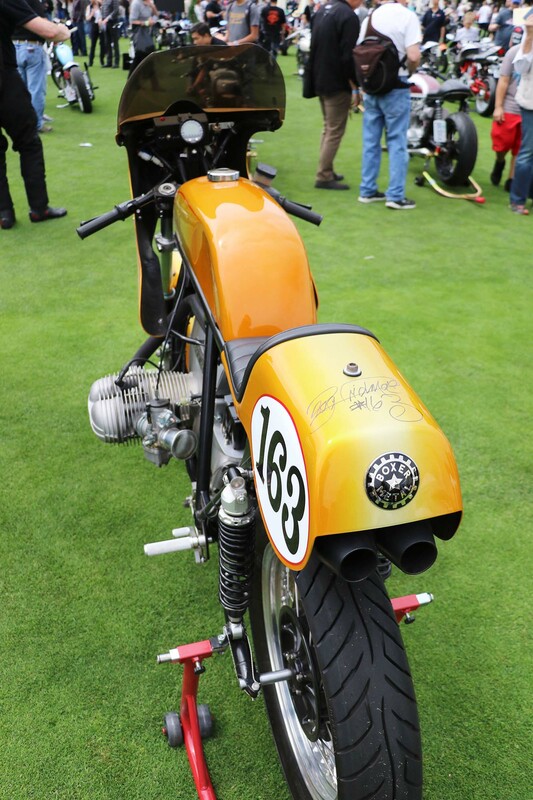 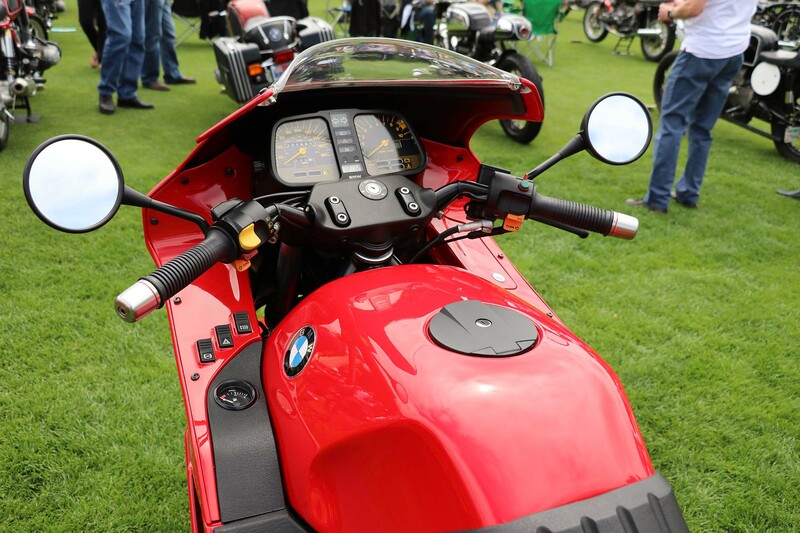 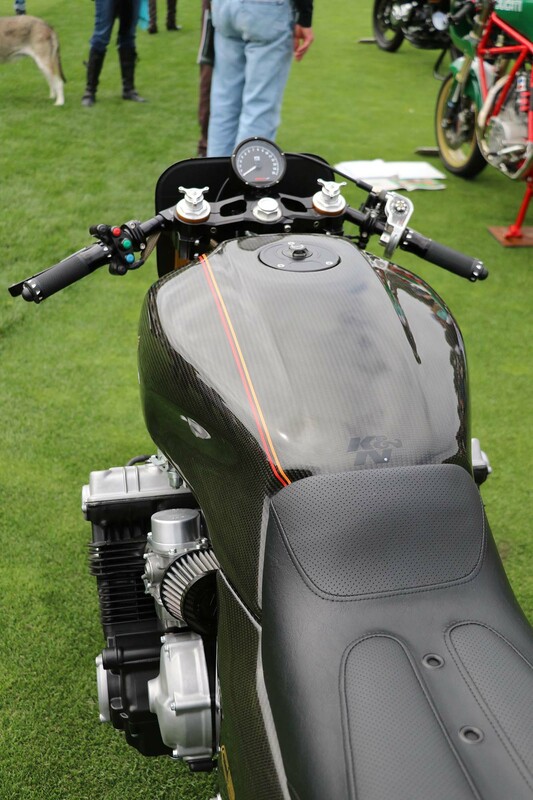 In addition to the bikes being shown by private entrants, many of the manufacturers had displays at the Quail. 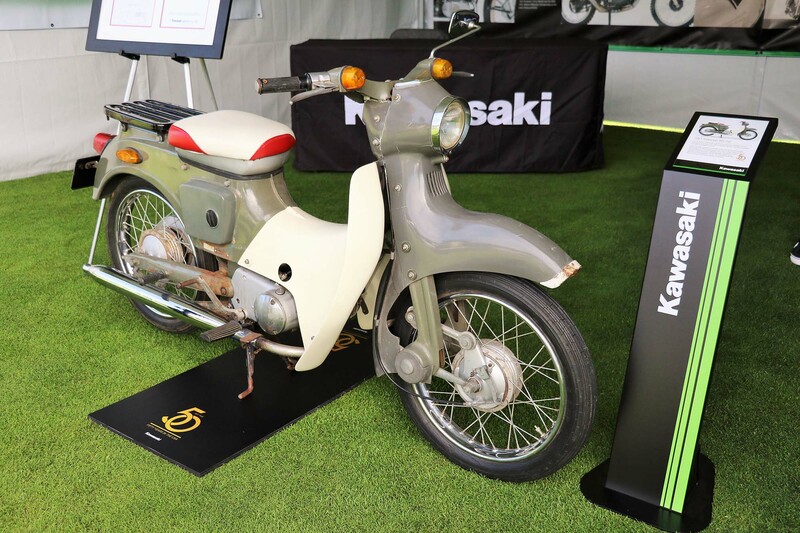 Kawasaki was celebrating their 50th anniversary in the United States, and had significant models from their past on display including a 1964 M5 Pet. 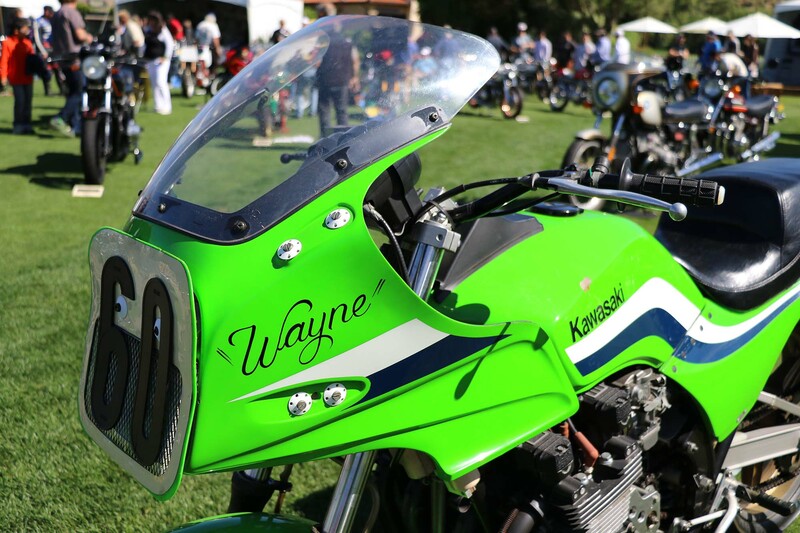 The Pet had a step-through design and was one of the first motorcycles marketed in the US under the Kawasaki brand name. 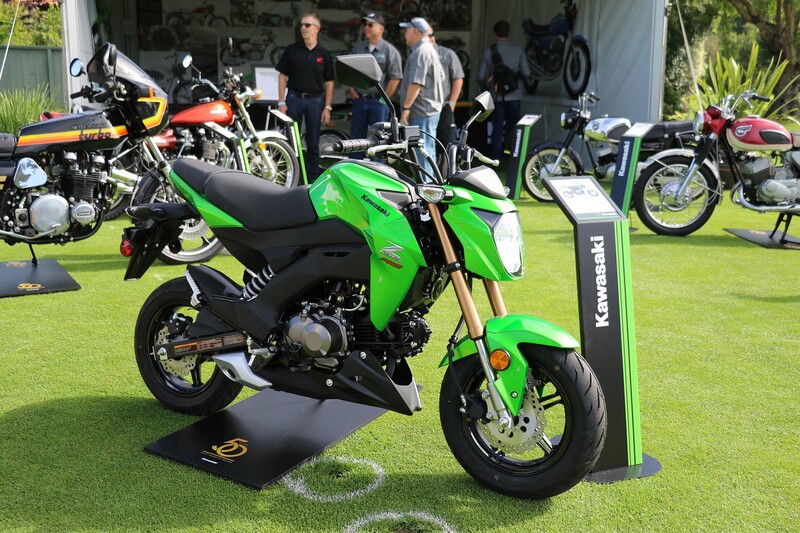 Kawasaki also took an opportunity to introduce its new Z125 Pro to the public, garnering a lot of interest from passersby. 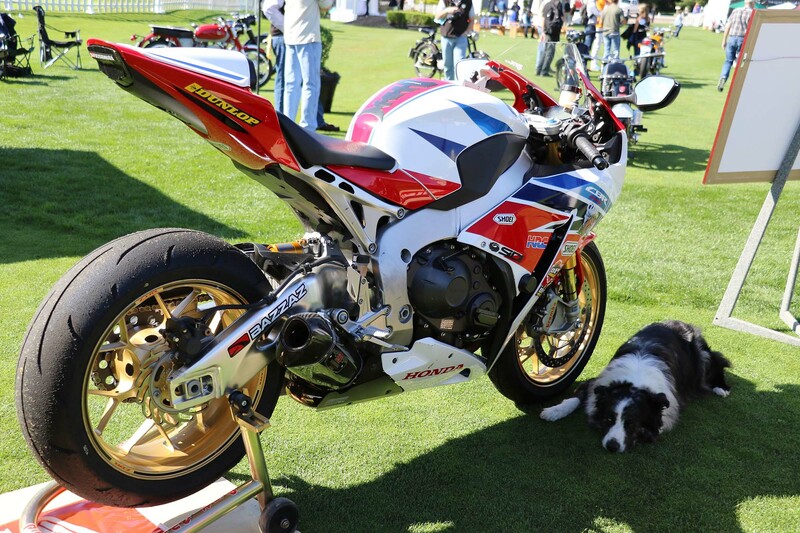 Honda was also on hand and paid tribute to the legacy of their Africa Twin. 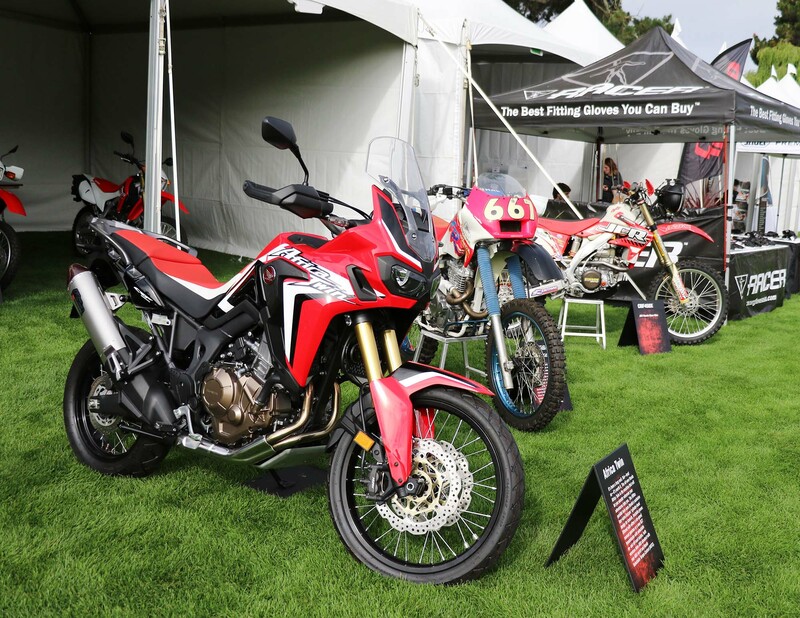 The Africa Twin drew crowds throughout the day, as did the Honda off-road race bikes that were parked nearby. 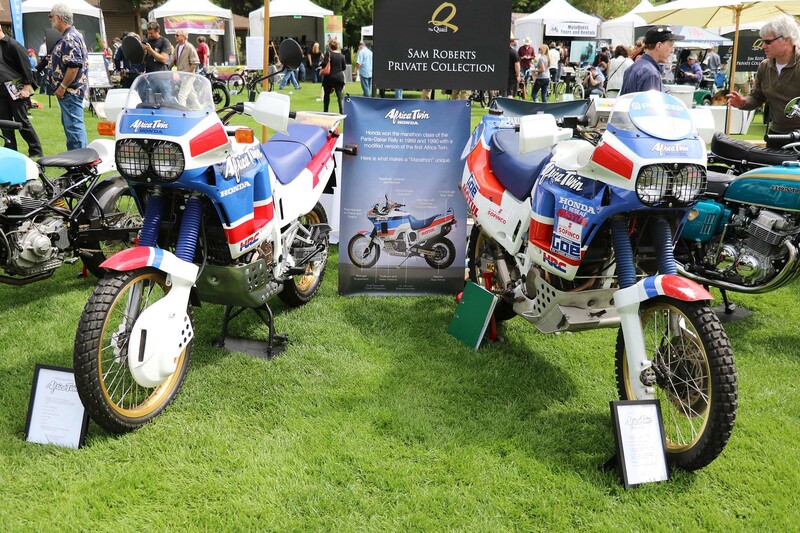 It was also fun to see the new Africa Twin next to a couple of restored models from 1988 and 1989. 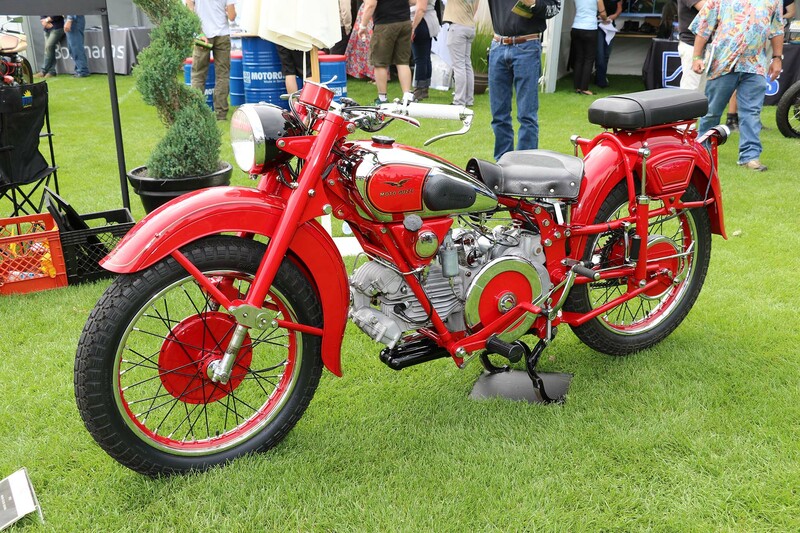 Though technology has improved over time, and the new bike is impressive, the original model had much success as well. 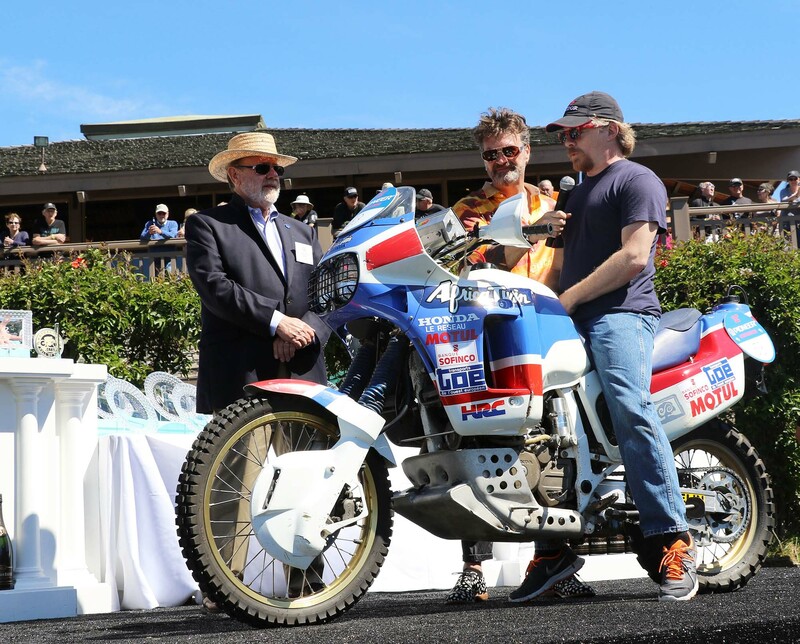 Honda won the Paris-Dakar three times in a row in the mid-eighties and released the Africa Twin as a tribute to that accomplishment. 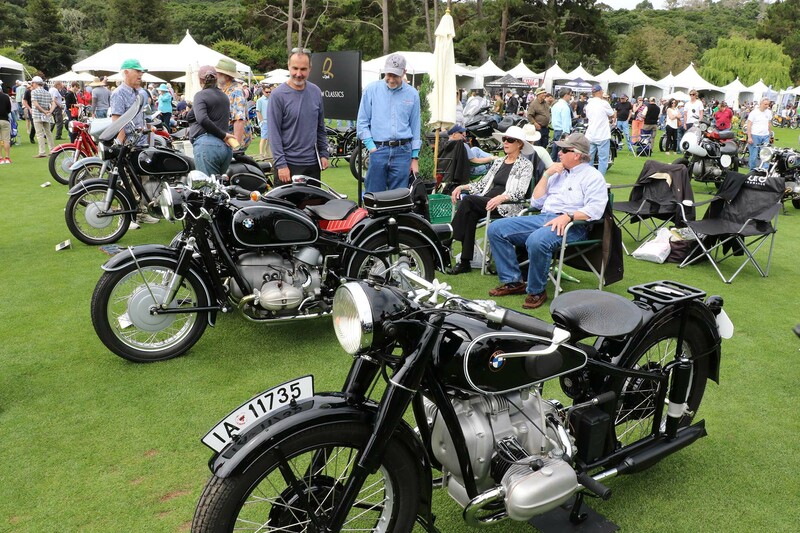 Besides motorcycles of every variety, the Quail also attracted important riders from throughout the motorcycling community. 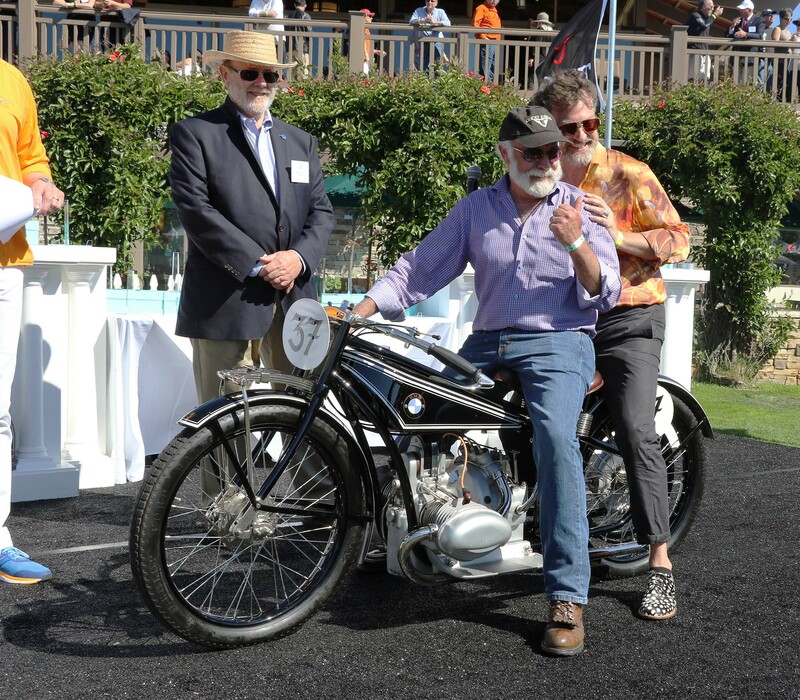 The featured guest for this year’s event was 3-time AMA Superbike Champion and Hall of Famer, Reg Pridmore. 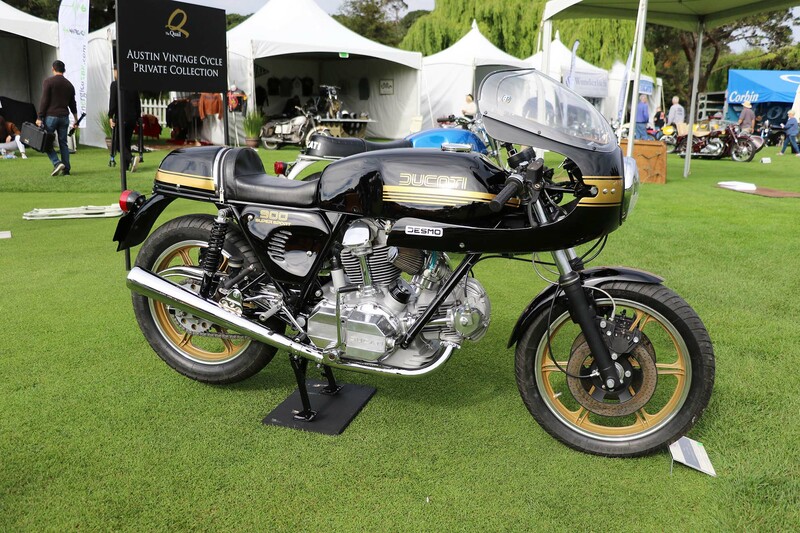 Pridmore won his Superbike titles in 1976, 77, and 78; first on an R90S in 76’ and then on Kawasaki Z1000s in 77’ and 78’. 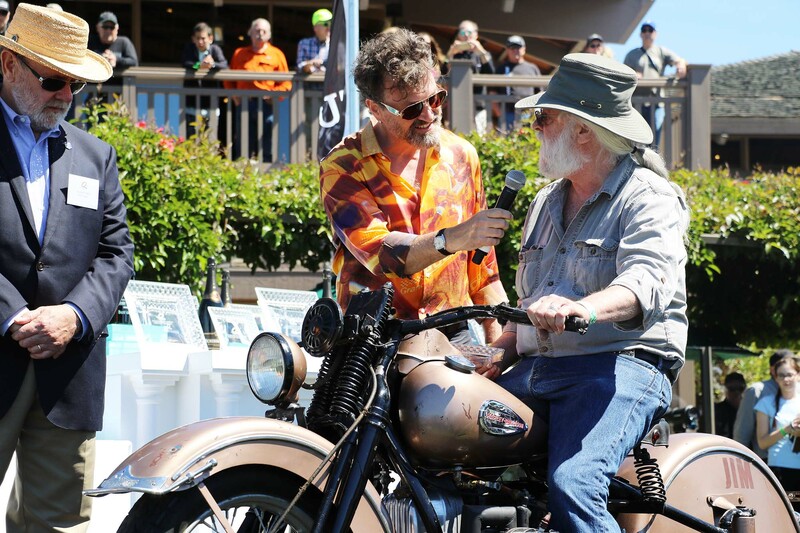 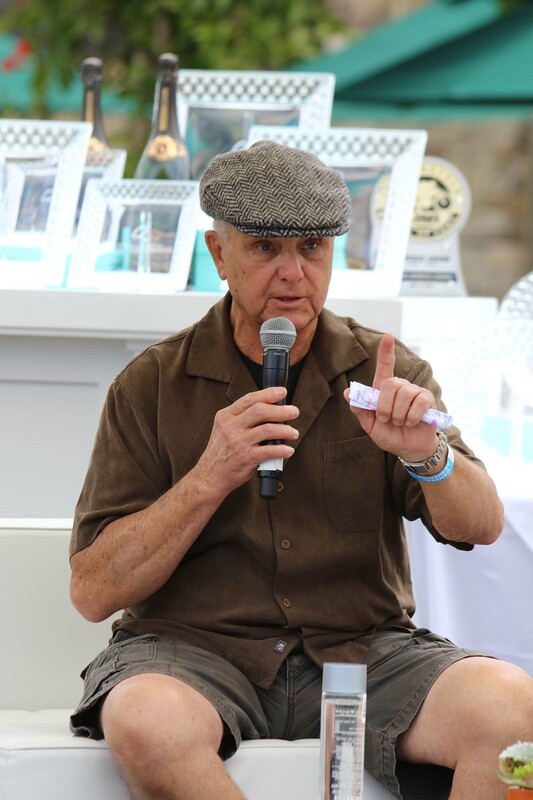 During his interview, he and Quail Director of Motorsports, Gordon McCall discussed the history of superbike racing in the US and also talked about Pridmore’s longtime history of teaching riding through his CLASS motorcycle school. 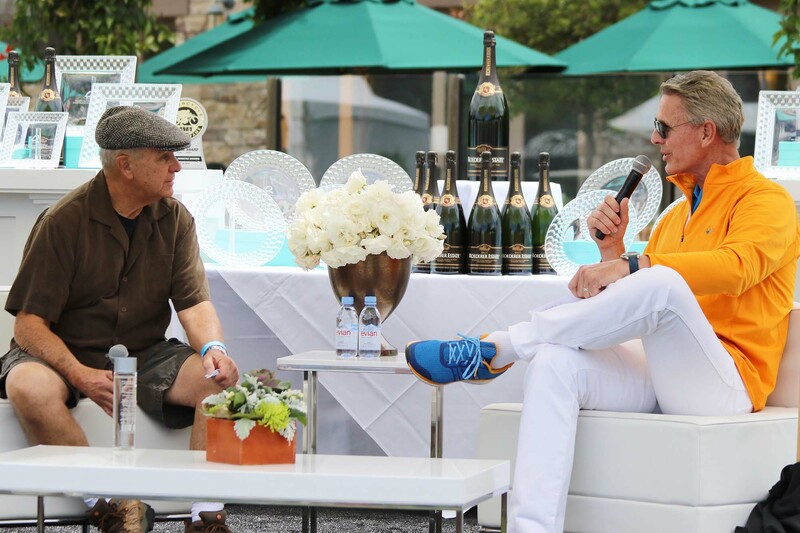 It was a fun conversation to listen to with lots of good storytelling and laughter. 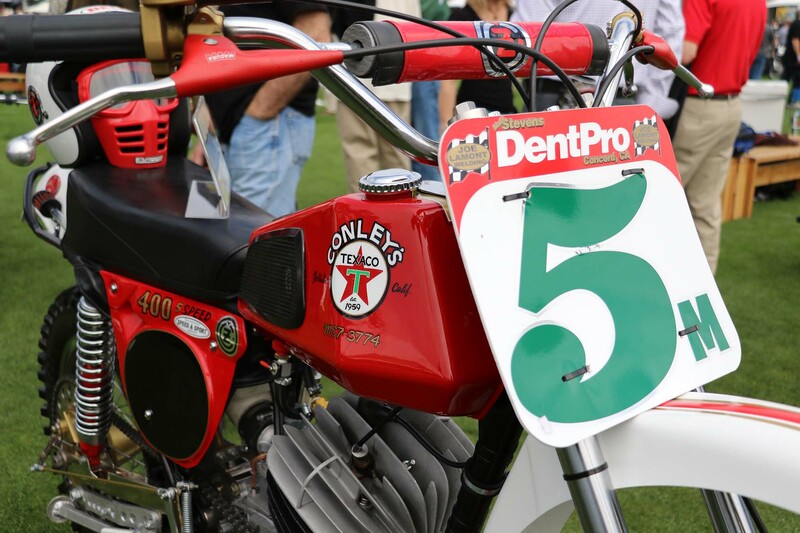 Besides Pridmore, AMA Hall of Fame member and Daytona 200 winner, Don Emde was on hand. 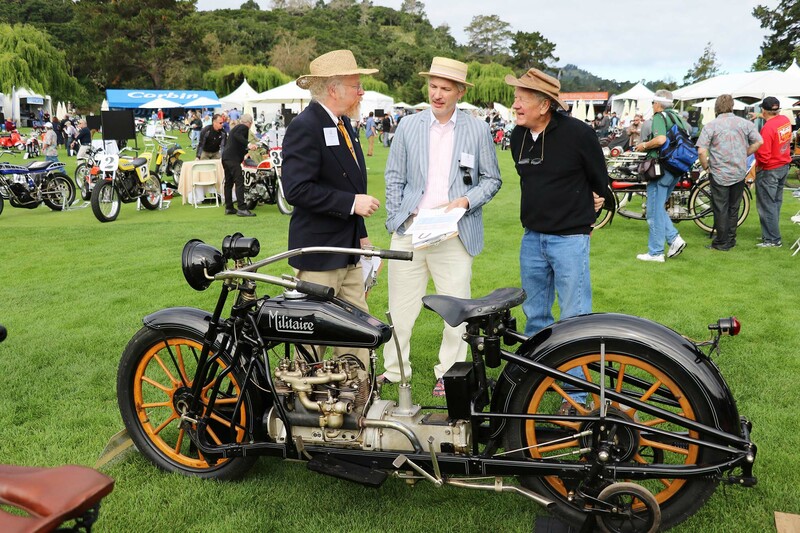 Emde was selling his book “Finding Cannon Ball’s Trail” that details his quest to re-trace the cross-country route of Erwin “Cannon Ball” Baker. 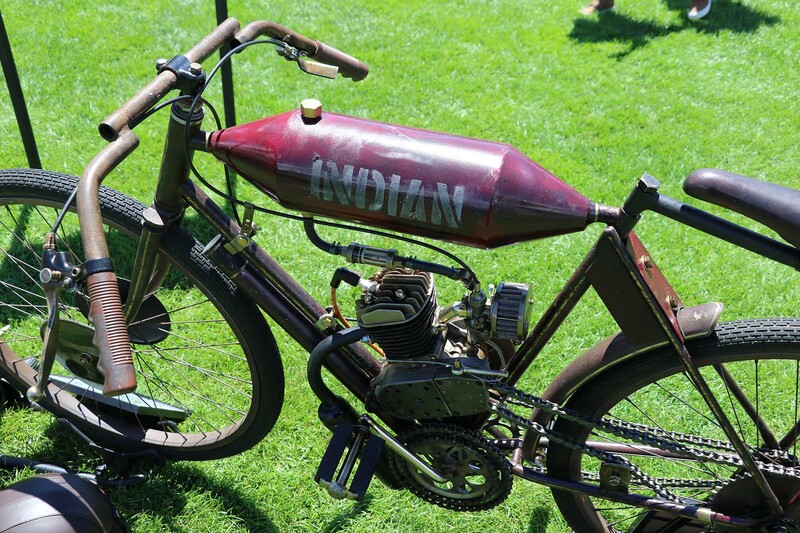 Baker crossed the country from San Diego to New York on an Indian motorcycle in 11½ days in 1914. 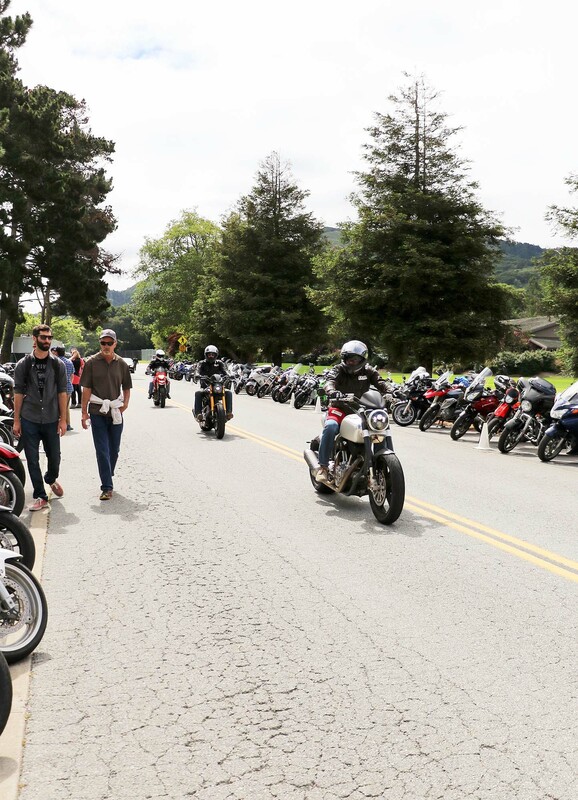 Emde embarked on a project to retrace that historic route in 2011, and in 2014, 100 years after Baker’s famous ride, he led a group of 30 riders that covered the entire route from San Diego to New York. 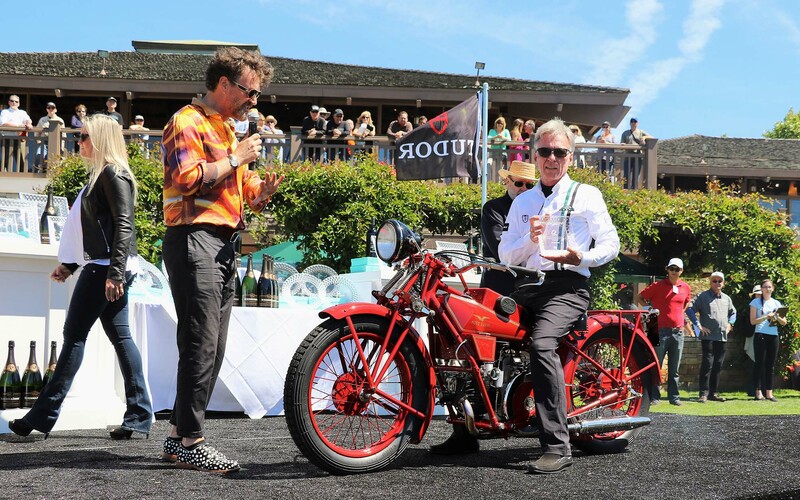 The book looks like it will be a very fun read. 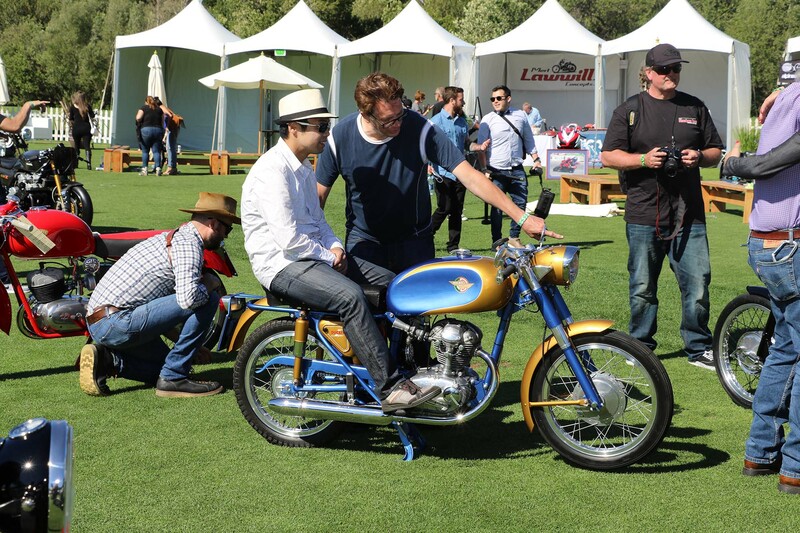 One moment during the Quail was particularly touching. 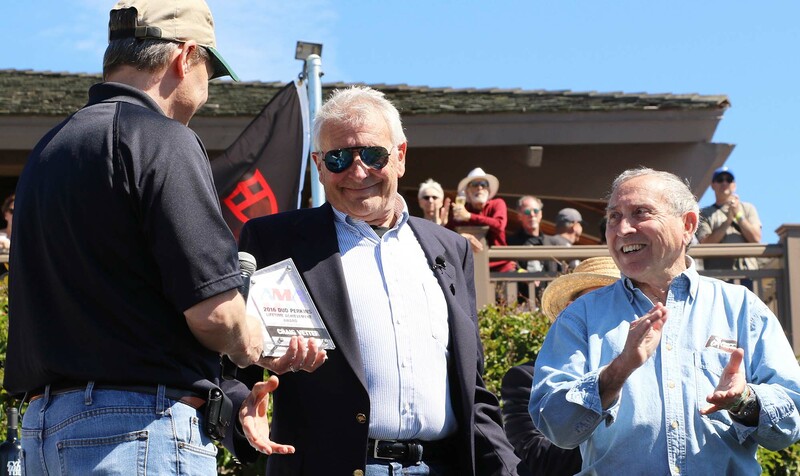 During the awards ceremony, the AMA Dud Perkins Award for Lifetime Achievement was presented to Craig Vetter. 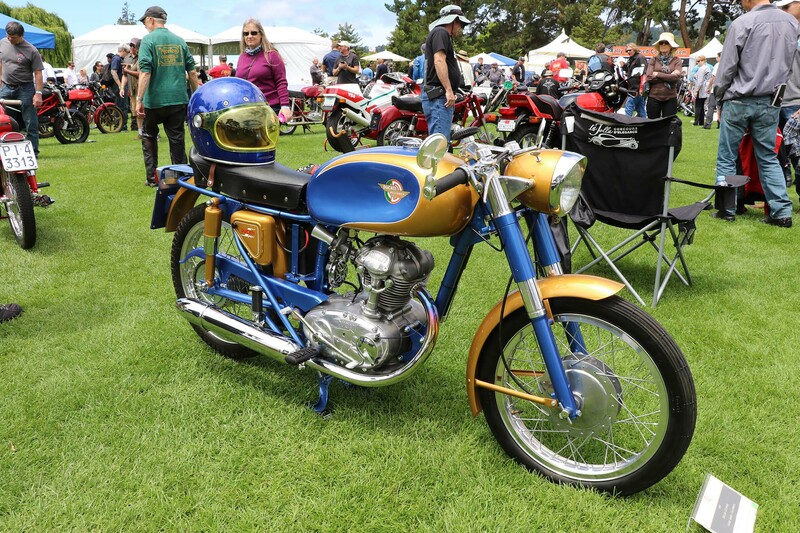 Vetter is the man who invented the revolutionary Windjammer fairing in the 70s and continues to innovate in the field of motorcycle slipstreaming to this day. 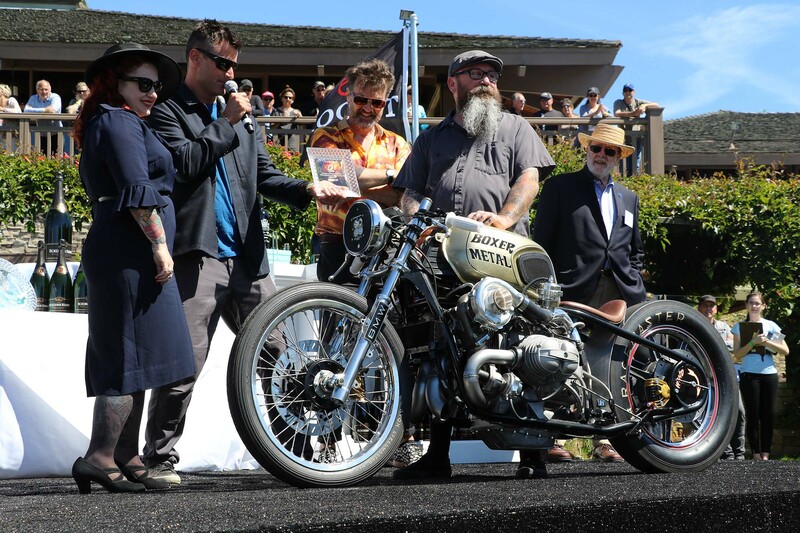 10 months ago, Vetter suffered a serious motorcycle accident when he struck a deer, and the awards presentation was his first public appearance since the accident. 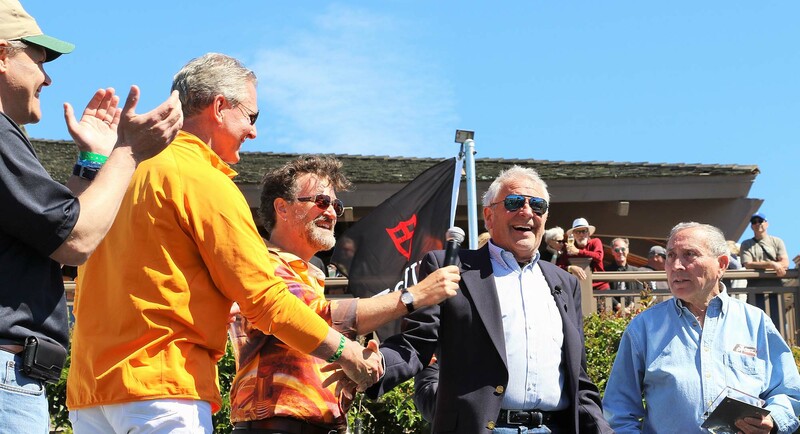 The crowd broke into cheers and applause as the legend was properly honored. 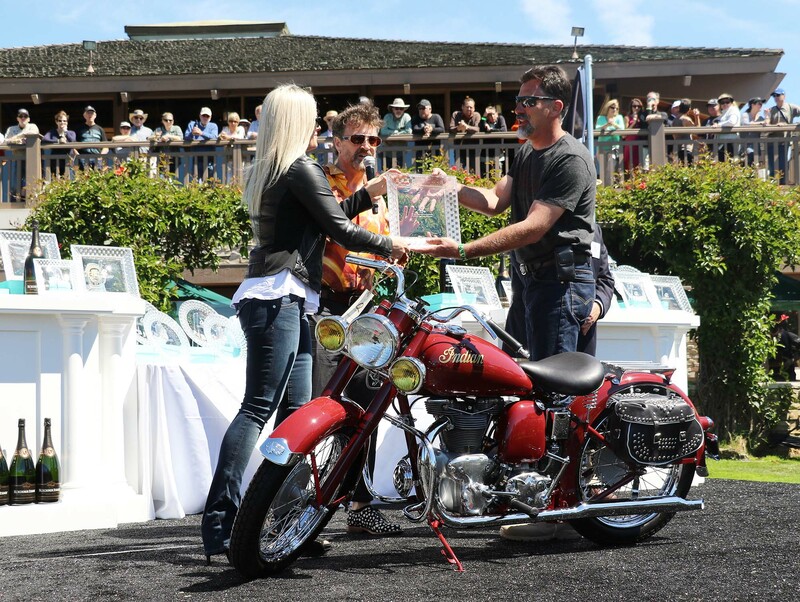 It was a very moving moment. 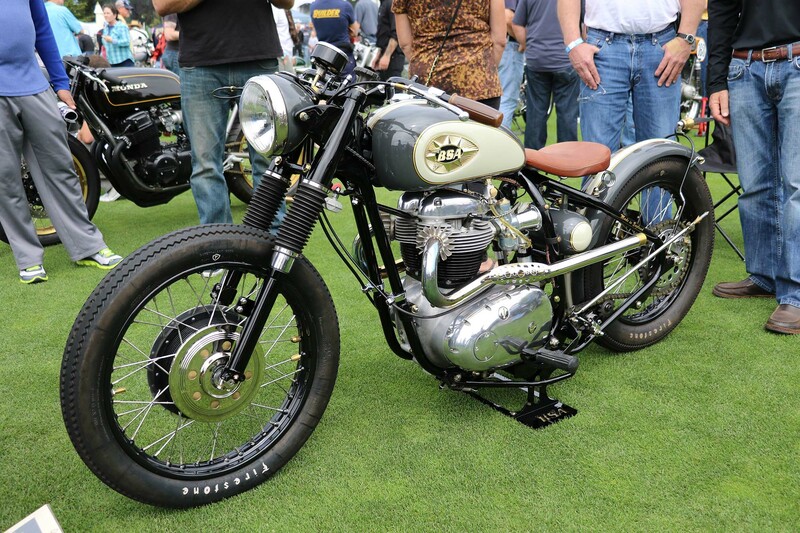 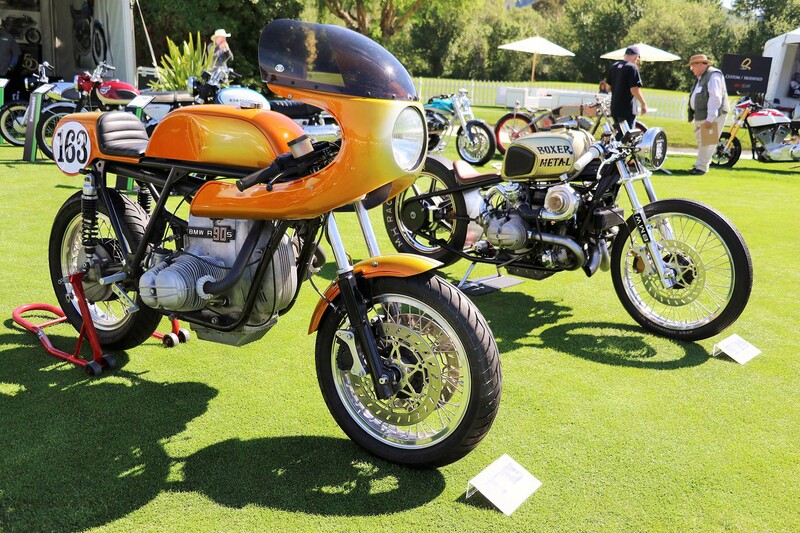 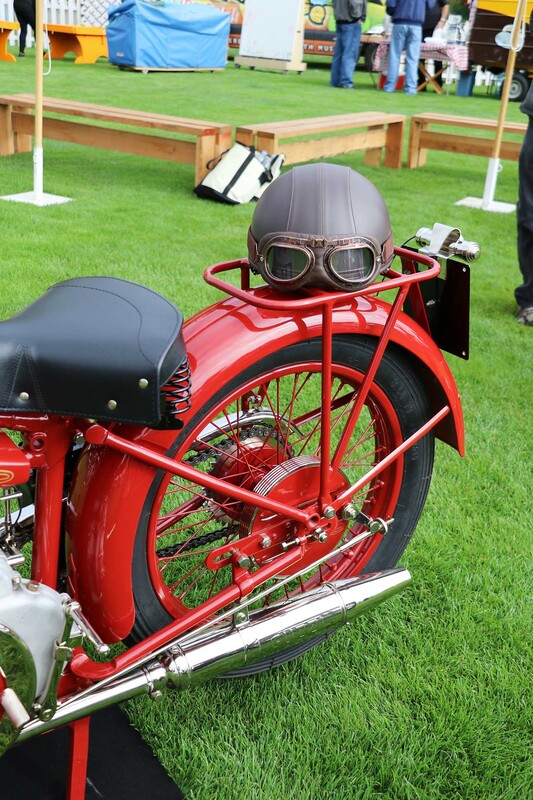 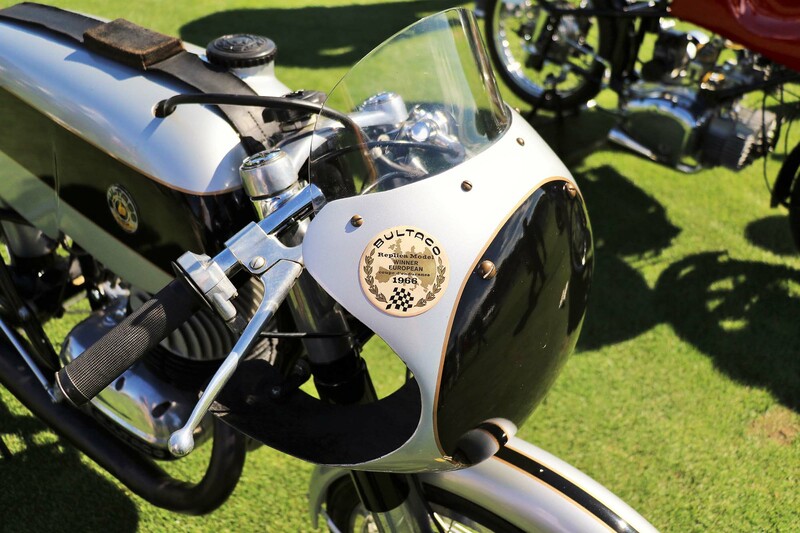 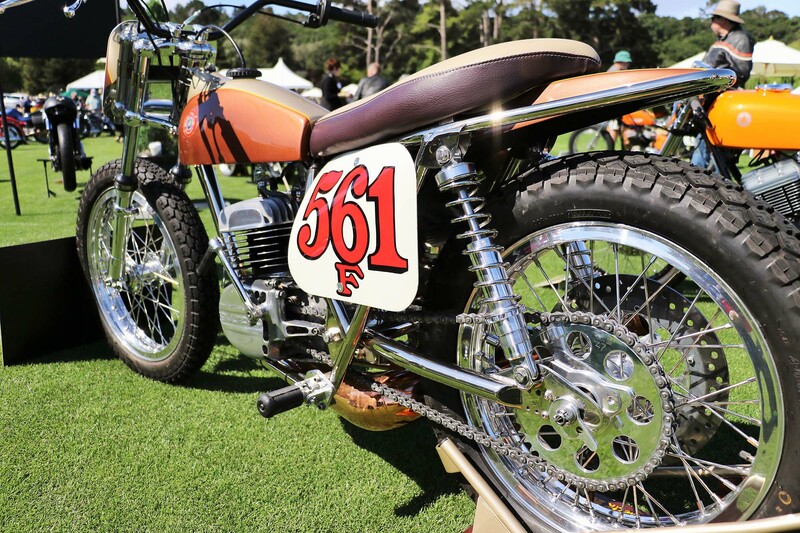 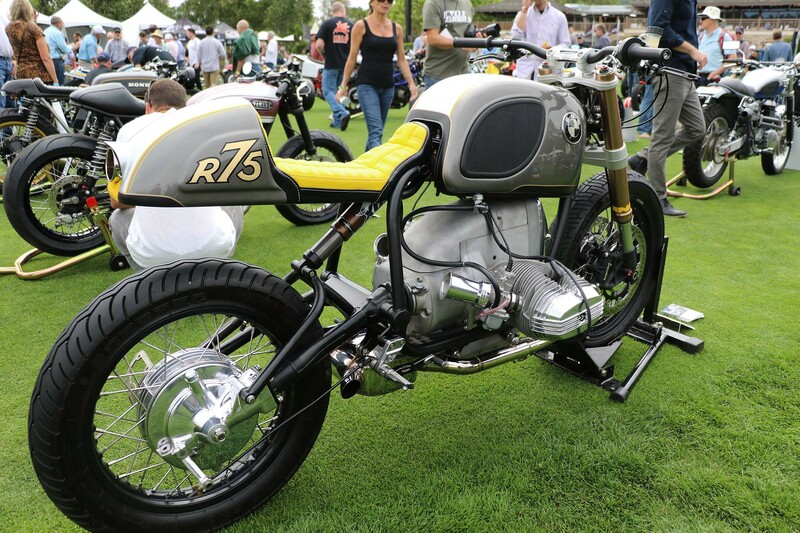 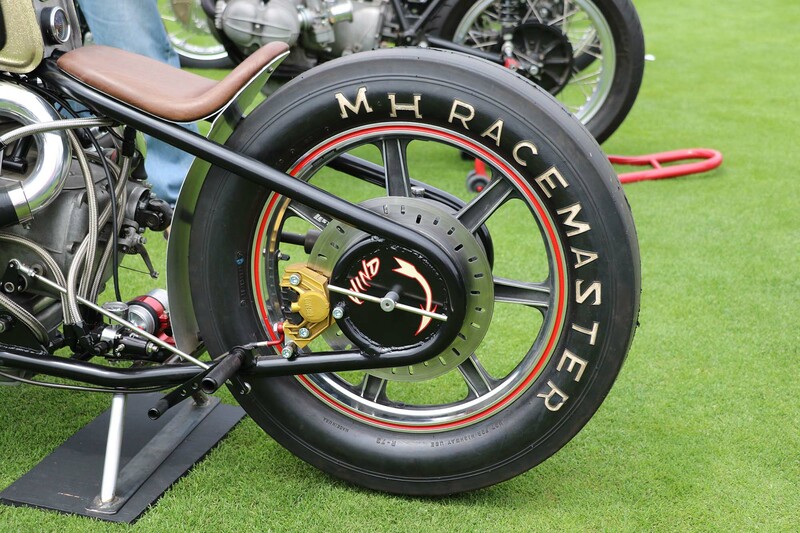 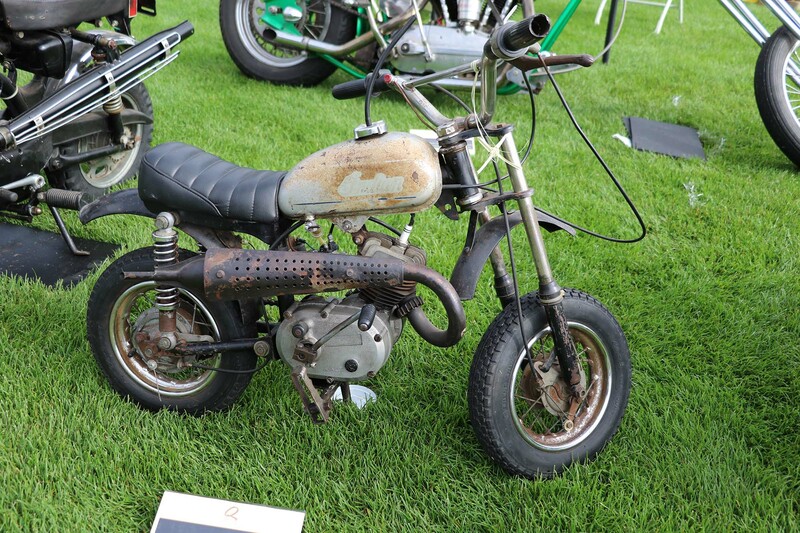 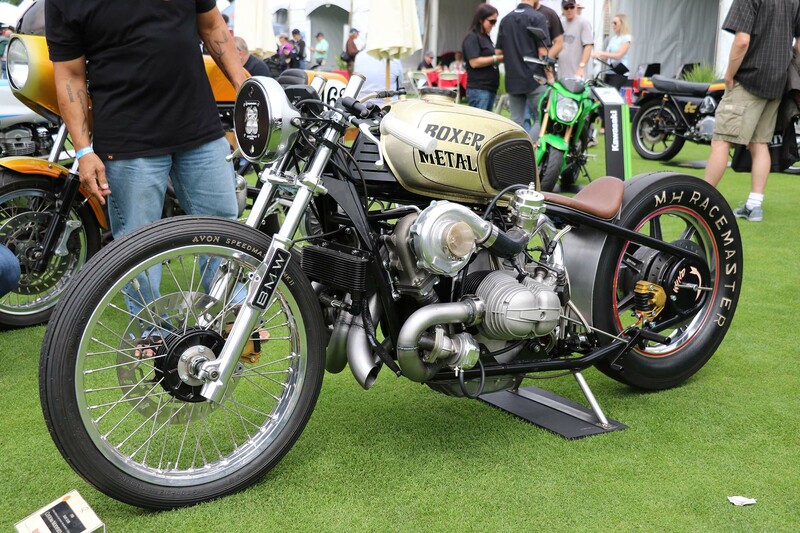 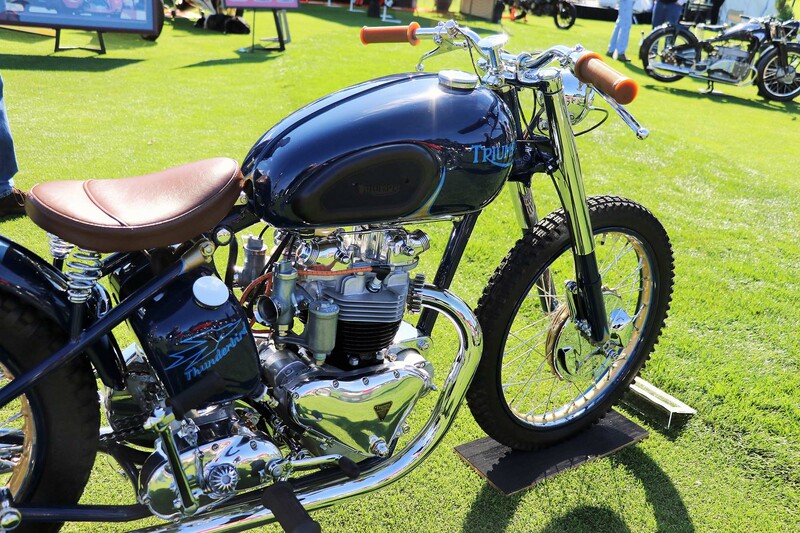 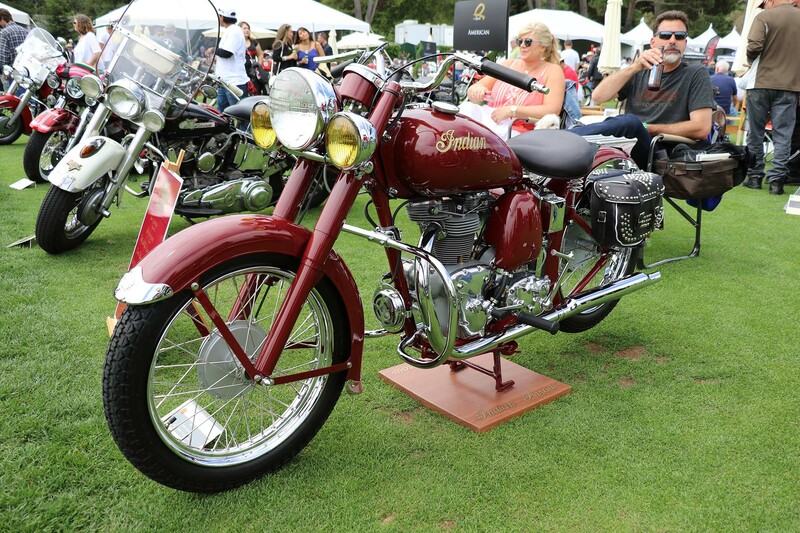 Once again, the Quail Motorcycle Gathering was an outstanding show. 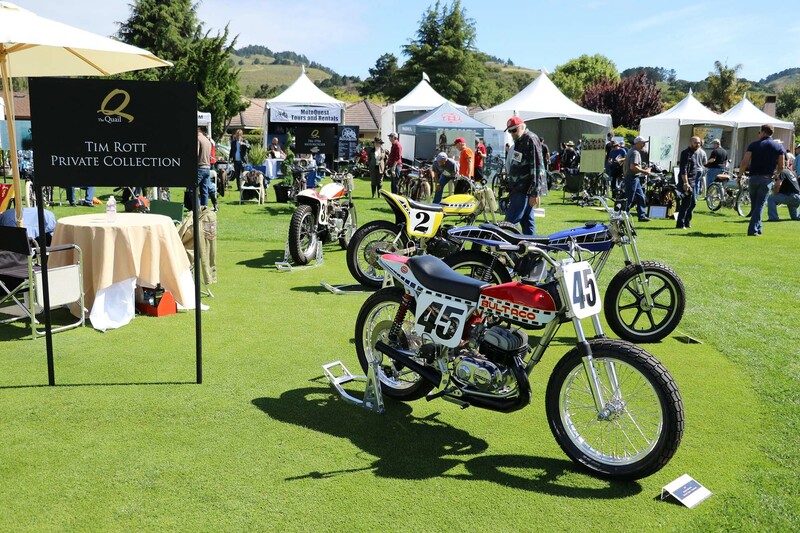 Gordon McCall and his staff pulled out all the stops to make this one of the best motorcycle events on the West Coast, if not the whole country. 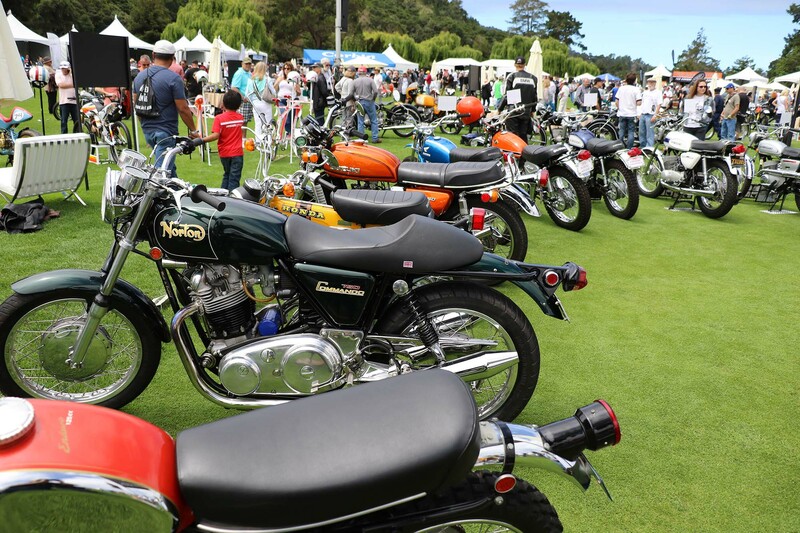 It’s definitely worth the time and effort to get to Carmel. 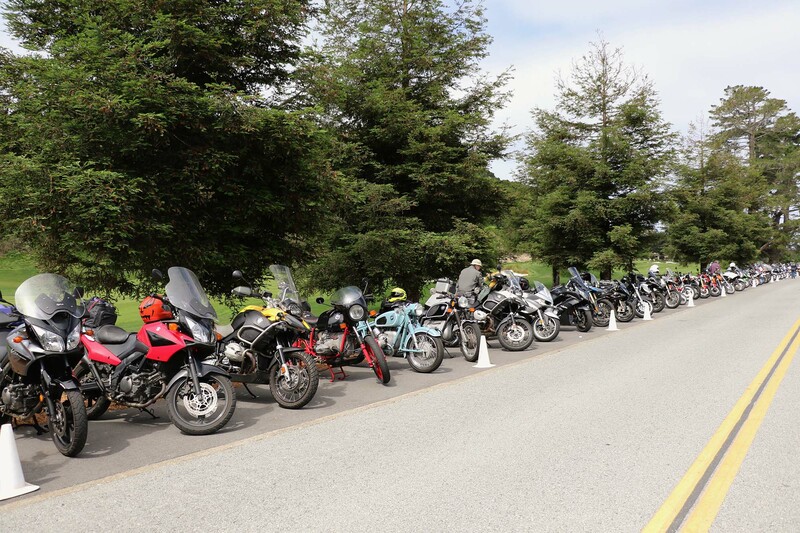 And since it’s on one of the nicest motorcycling roads around, there’s a great opportunity to combine this with a ride up the fabled Pacific Coast Highway. 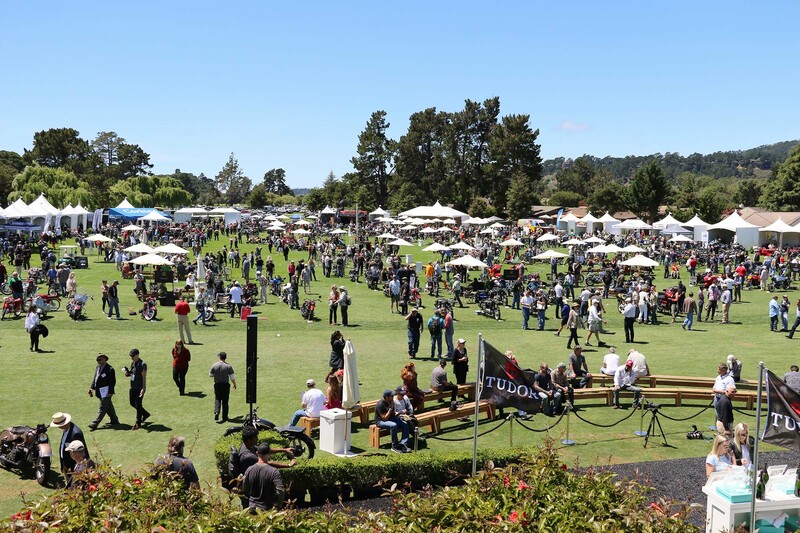 You should definitely add this event to your to do list.